Astro Commander is working on a new source for his miniature models, and that might mean more advanced designs for cheaper. 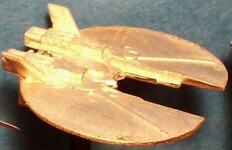 The ships are made out of a pewter material and have sharp pins to form the weapon detail. 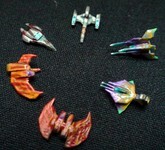 They're also scaled down to about an inch long to accomodate tabletop gaming. Thought some of you may want to know, a trial run of the studio bergstrom ships have just been completed and should be available for order soon. 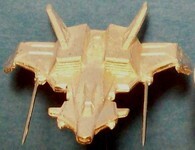 They are cheaper and higher detail, in general, than what we can get from shapeways. 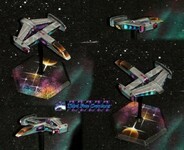 I have mine on order and look forward to painting these! 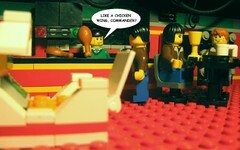 Mr. Lee has more awesome Lego art to show off. 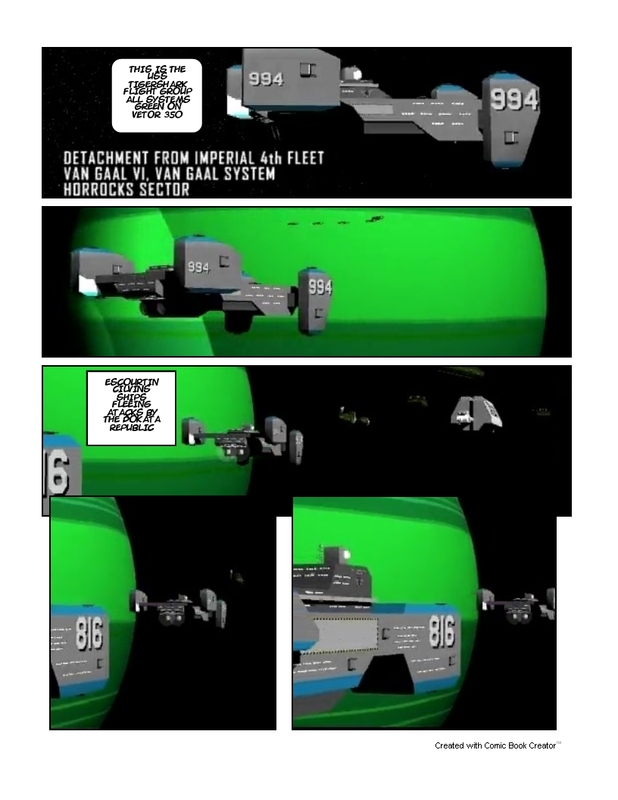 The first image is an example of the comic adventure that Marcus plans to make. 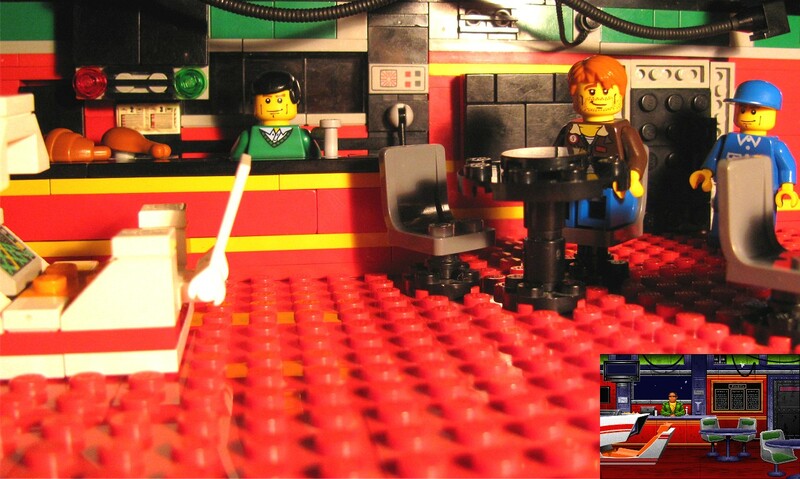 That's clever use of a Lego prop there. 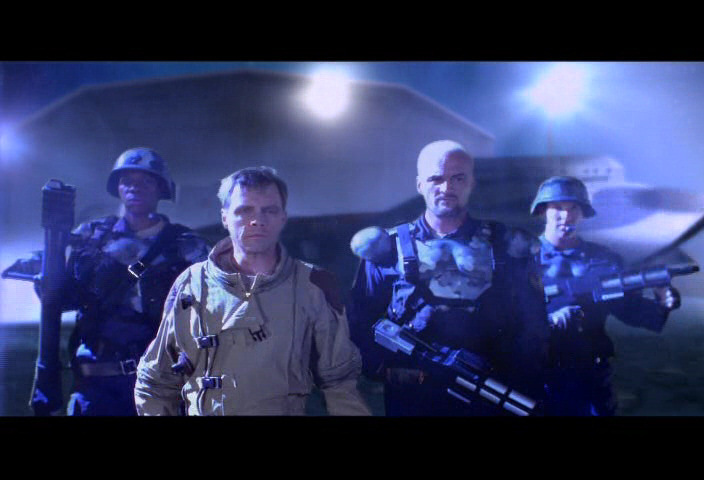 The second shot shows a very well done medal ceremony scene. Even the floor paneling and spotlights are right on! The new poll asks what timeframe you would like for the next Wing Commander game. There's quite a range to choose from! Options begin with the early war events prior to Wing Commander 1 and end with the Kindred turmoil in Privateer 2. A big swath of time has been carved aside for the Nephilim War after Secret Ops, and Arena kicks off the largely unknown events of the 28th Century. Which would you like? The previous poll asked about people's thoughts on the year ahead. It's interesting to see how the percentage evolves from week to week. People who visit every day are clearly optimistic! 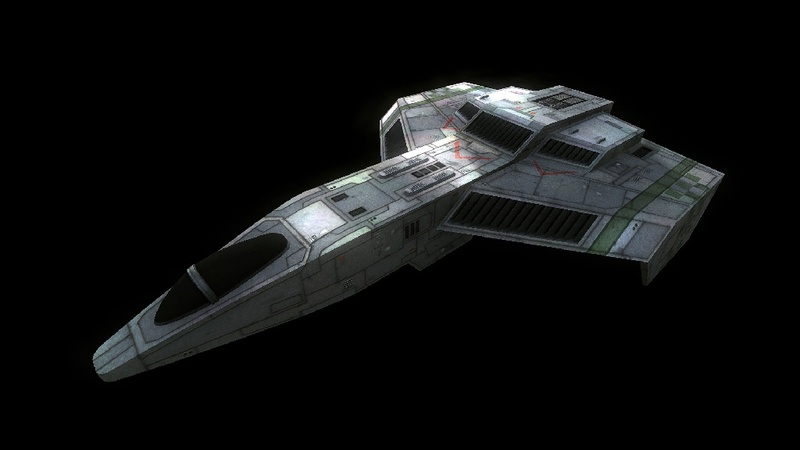 We're sure they'll be tons to come in the next eleven months to make all Wing Commander fans happy! January has been a tremendous month for the WCPedia! There are now more than 1,600 articles, some 150 penned in just the last couple weeks. Game missions have been a big push as they lay the foundation for future expansion. A skeleton index for all games' missions has been created to map out the work ahead. P2 missions have been a big success, and there is a larger P2 skeleton for additional data entry. Help lend a hand and join the fun! I'm having the time of my life with this WCPedia stuff, I wish I could do it full time. It's finally coming together to be something I've wanted to help create for fifteen years now and I'm doing it with some absolutely brilliant folks. 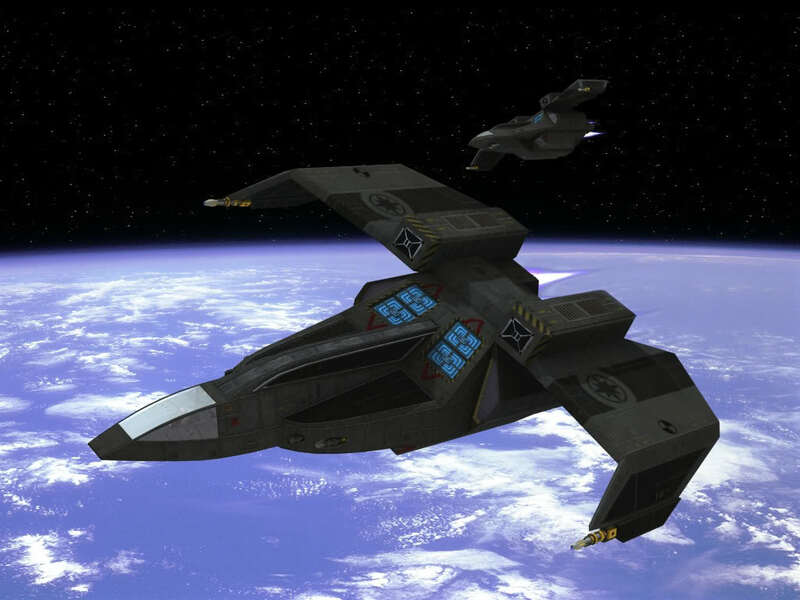 Just chatting with Dundradal and whoever else shows up on #WingNut about incredibly detailed Wing Commander continuity is a thrill (even though that almost always means we aren't doing real work because we're plotting out something cool that's fifty steps away). 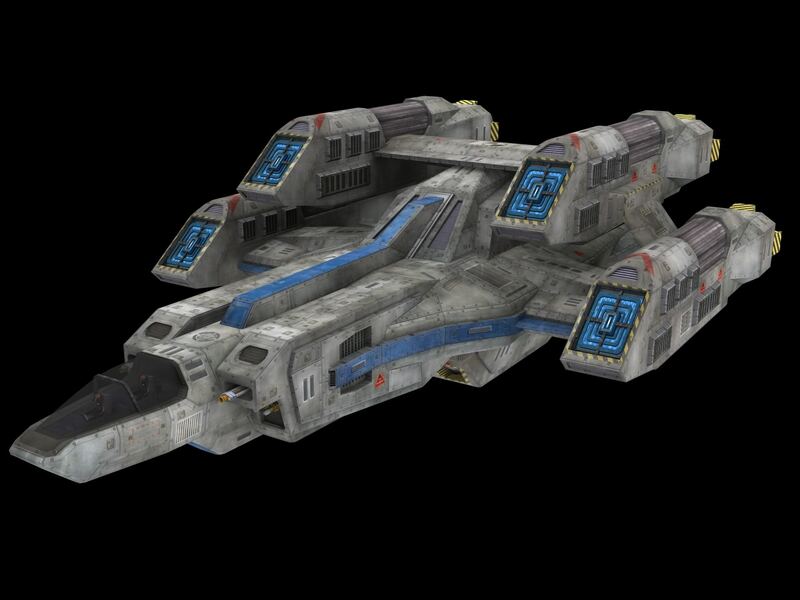 ScoobyDoo has posted another big batch of creative Wing Commander models. 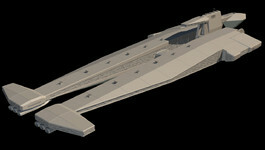 Many of the ships have hybrid elements or designs inspired by other craft. Check out the Thunderbolt/Longbow and double-missile Broadsword. 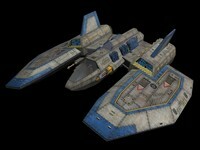 The last three are even Confed-branded fighters from Privateer 2: the Heretic, Ecantona and Skecis. Pretty sharp! WC Saga has kicked off a set of people profiles that show off the new character models and share background info. They've started with "Sandman," the mod's primary protagonist. 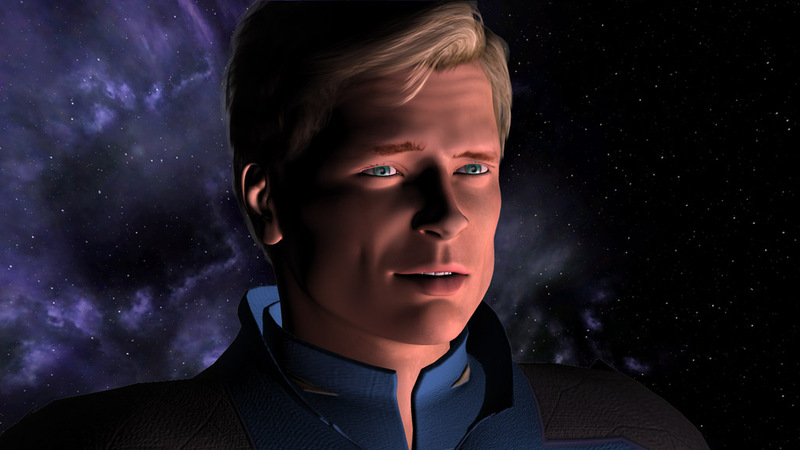 Our hero of Wing Commander Saga: The Darkest Dawn, this young man is first seen in the Prologue as he finishes up his flight training. 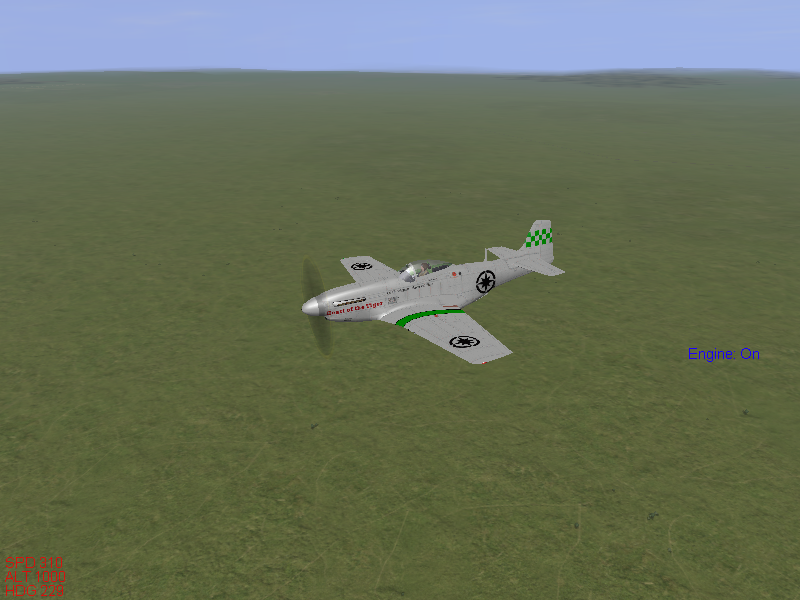 With his training complete, while much earlier then expected, he is now a fully qualified combat pilot. Transferred to the TCS Hermes as a battlefield replacement, it is here that Sandman’s journey will truly begin. 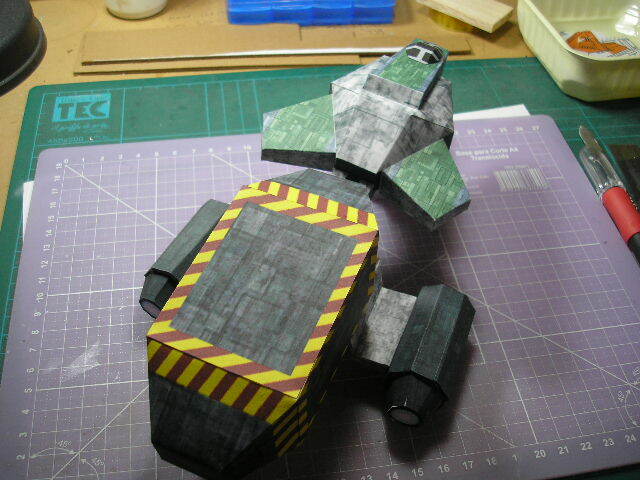 Astro Commander doesn't just make amazing models to look at. 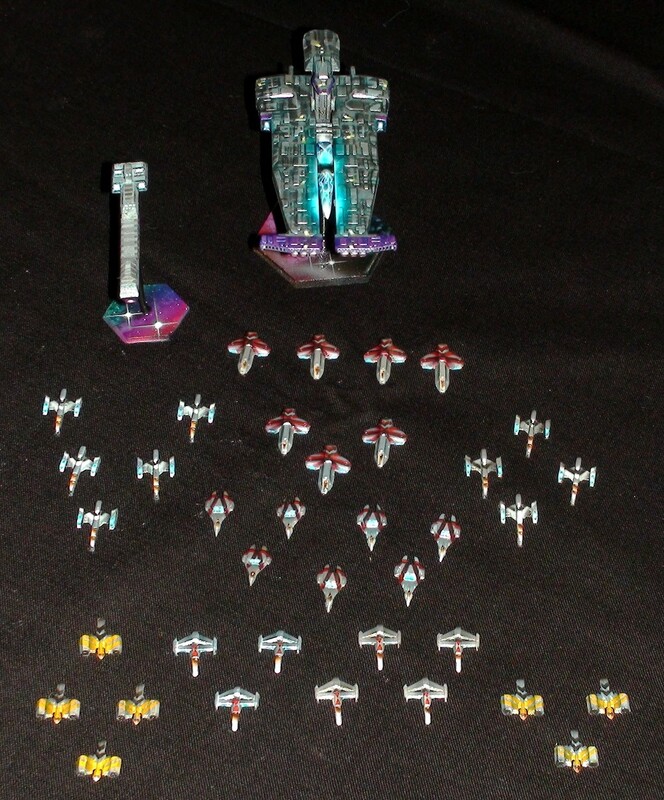 His amazing fleet will also soon be used for tabletop battles. 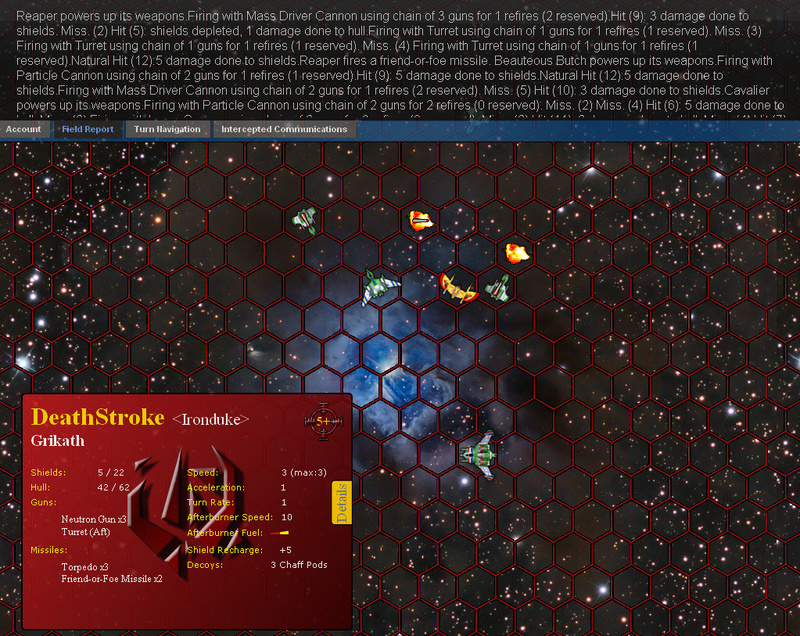 He's posted a set of sample rules (120 k .xls) to explain how the game will work for this. It's quite detailed and looks like a ton of fun. It's great to see people coming up with projects like this, and maybe some of them can even be played with paper ships. I use conventions as motivators to get painting and rule development done. 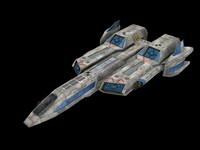 I am hosting a Battlestar and a Wing Commander game at the con noted in the link. Rules can be found at the link or on my website thirdfatecreations.com. 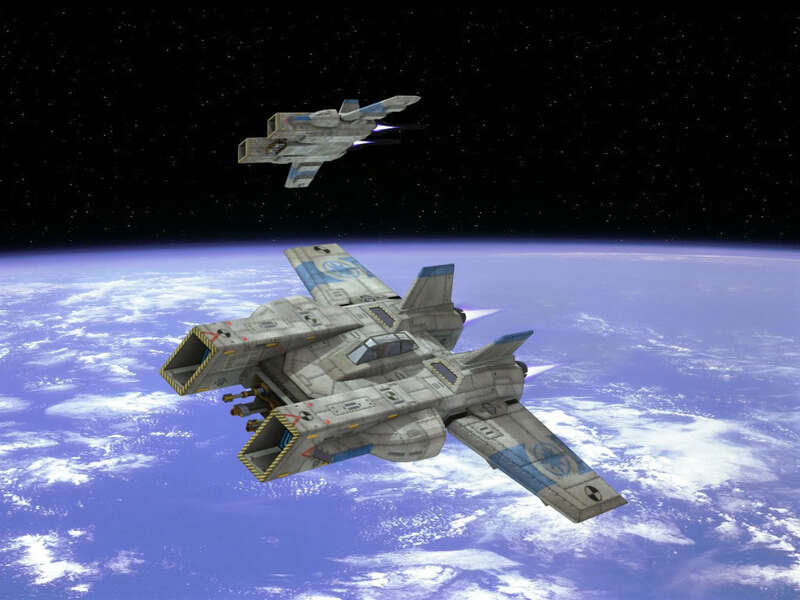 Battlestar and Wing Commander rules are similar but have their differences (implementation of shields, jump technology, energy allocation). But I try to keep the rules relativly simple for fast uptake at cons. Once all sides know the rules the battles generally go pretty quickly. Fighters die like flies (as it should be). The Wing Commander game will be Nephilim against a coalition of Confed, Kilrathi, and possibly Border Worlds (with leftover lance tech). 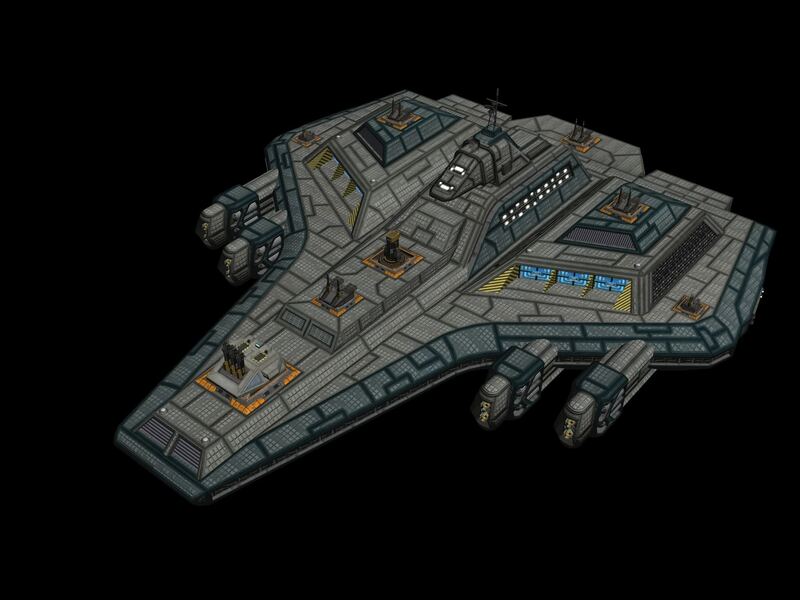 The coalition will be larger in size, but hey, they will have two ship/fleet killer weapons bearing on them. 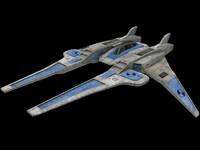 A third race will come into play if the coalition is getting its but kicked too quickly=). I will be playing the Neph as the defender of their foothold in the Kilrah system. 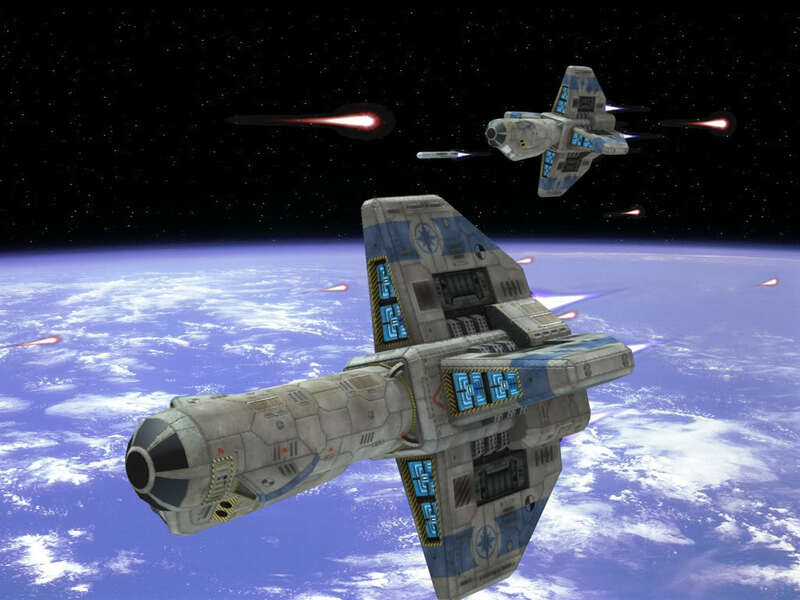 The coalition will have a couple objectives, that don't require exterminating the Neph, to win. Mr. Lee's combined two of his biggest hobbies into one beautiful art form. 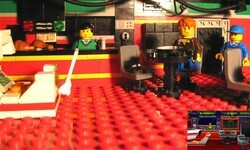 He's recreated the Tiger's Claw bar with Lego bricks. It's really detailed and well done. As clever as this setup turned out, it's not the end of his project! The plan is to recreate a number of scenes from Wing Commander 1 and make a comic-style story out of the settings. We can't wait to see how this turns out! My name is Marcus and I'm from Germany. 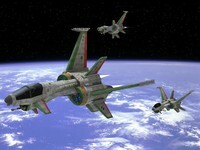 I'm a great Fan from all Wing Commander games, but I love WC 1 and WC 2. 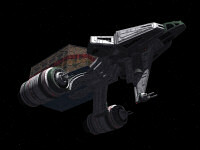 I will make all the locations of the TCS Tiger's Claw with LEGO bricks. 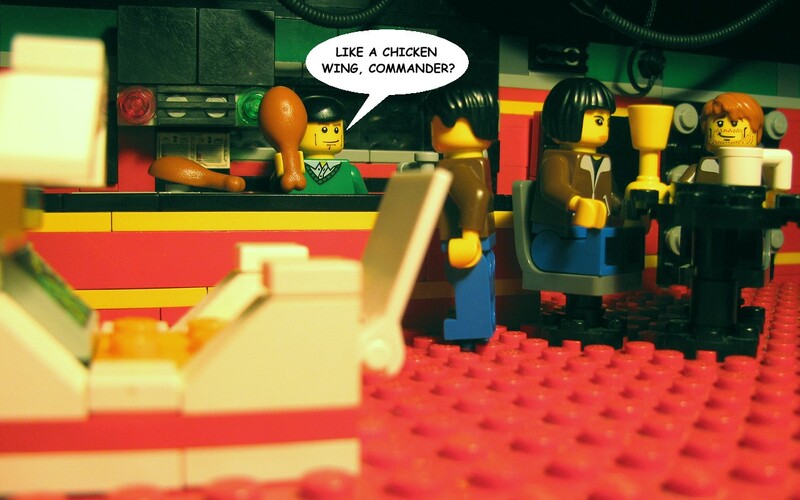 When I have finished the locations and sequences, I will make a Wing Commander LEGO comic strip based on the story with many gags. I will give you a first picture of my project. You see the bar of the Tiger's Claw with the brick-characters of Shotglass, Hunter and Col. Halcyon. There's a new test game of Wing Commander TacOps in the works, so now's your chance to get in on a preview of the action. The game will begin as soon as the new tailing feature is added, which could be just a few days away. Curious players can sign up at Crius.net and choose their fighters now (no capships in this battle!). 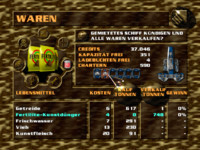 A sample of the previous game can be found here (works best in FireFox). 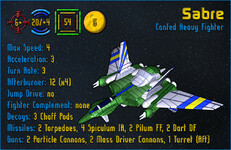 Game rules can also be found at the TacOps website. General progress update: I've now put in a rough form of a movement-phase field report (seen during CP phase). 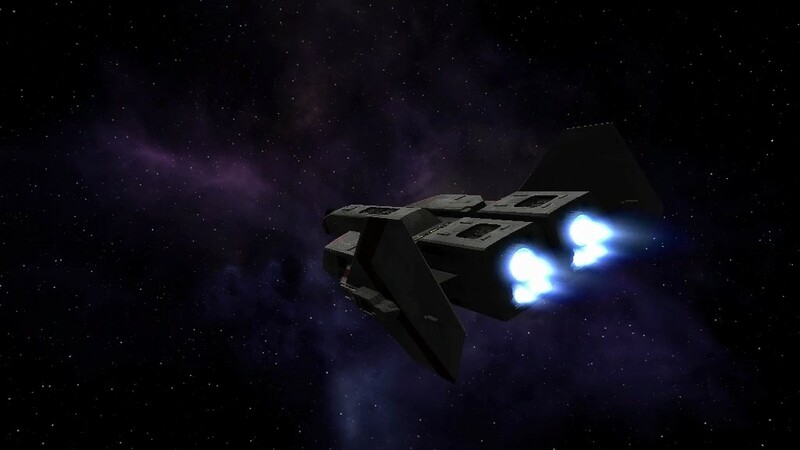 It's completely untested and pretty basic; hopefully it looks okay. I've also started roughing in the code for tailing. It still doesn't do anything visible to you, but it is now trying to pass forward some info to the movement phase from the end-phase. Let me know if you see any side effects, and especially watch out for processing error messages on the turn selection screen that you reload to detect new turns on. 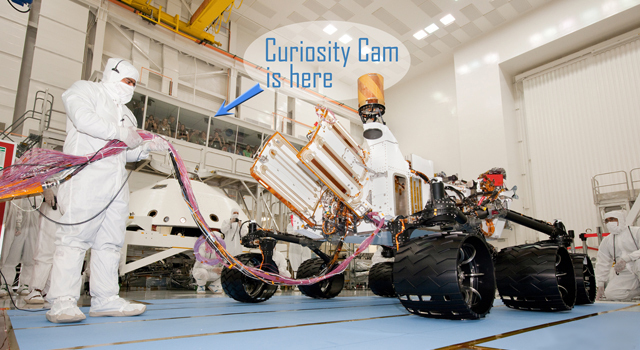 The NASA Jet Propulsion Laboratory has set up an awesome webcam to view the construction of their next Mars rover in real time. 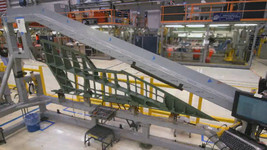 Check out the UStream feed to see work as it progresses. The Mars Science Laboratory, Curiosity, is scheduled to launch towards the end of this year. Talented Wingnut eddieb is involved with the robot's software development. 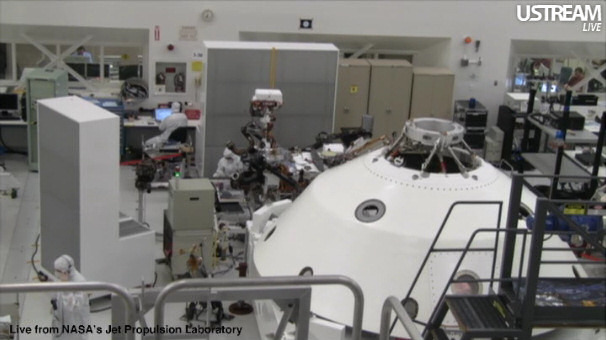 Look inside the clean room at NASA's Jet Propulsion Laboratory in Pasadena, Calif., to watch the next Mars rover being built. The camera is located in a viewing gallery above the clean room floor. There is no audio on this video feed. Technicians are working from approximately 8 a.m. to 11:00 p.m. PDT Monday through Friday (except holidays). 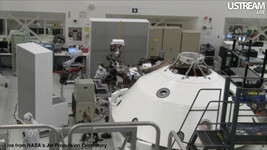 The camera shows a portion of the clean room that is typically active; but the rover, spacecraft components and technicians may move out of view as work shifts to other areas of the room. When activity takes place in other testing facilities around JPL, the clean room may be empty. 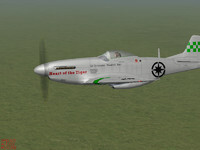 TopGun has been playing around with fighter skins for IL-2 Sturmovik and came up with this neat livery. The basic gray hull is accented with green checkerboard, a Confed star and some familiar text markings. 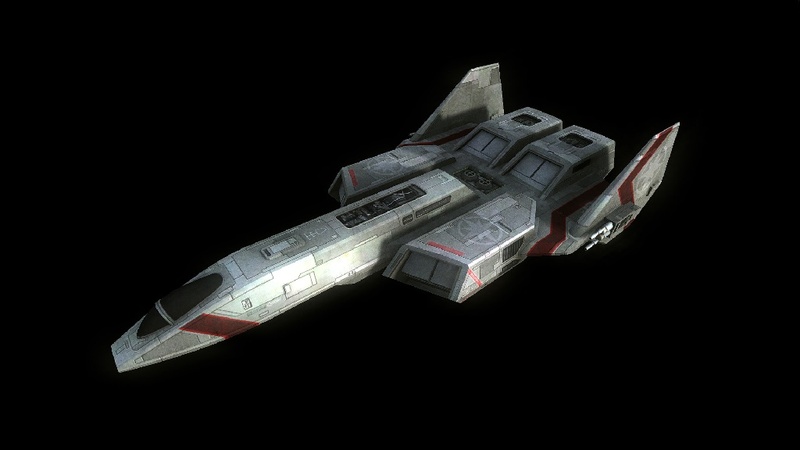 It's a cool nod to the Hellcat paint scheme from Wing Commander 3. David Phillips' MySpace Blog has posted an interesting 1997 interview with Cobalt 60 co-founder Jean-Luc De Meyer. A couple questions relate to how Cobalt 60 got involved with the game and what preparation took place before recording. You can find the complete interview here. 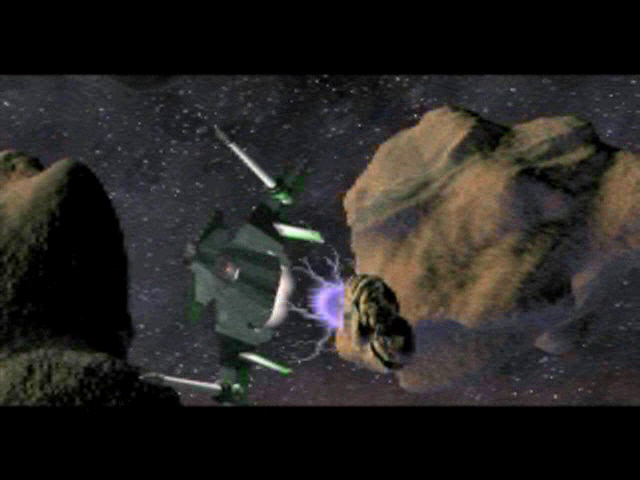 Q: Another group you are working with, Cobalt60, is doing the soundtrack for the CD-ROM game Wing Commander V. How did that happen? 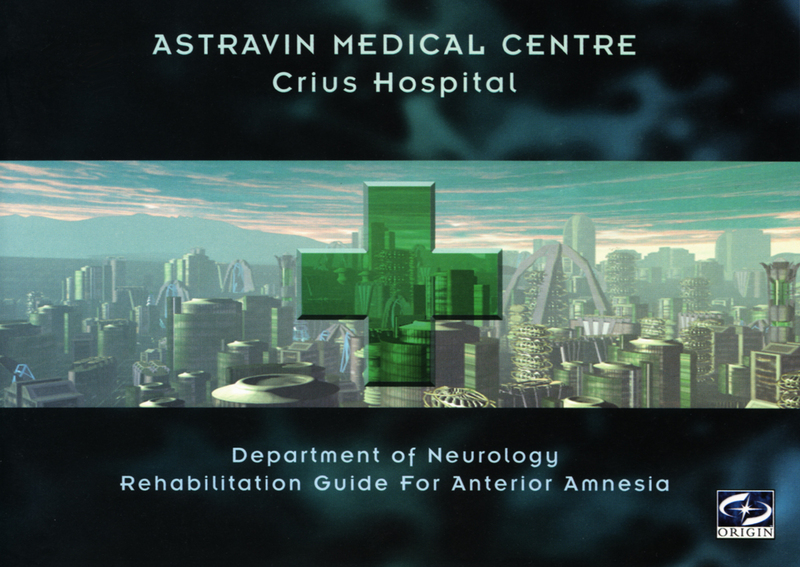 A: Our record company sent copies of our first album to some people in the business and were contacted by Origin who showed interest in us writing songs for the game as they believed our type of music would fit the new direction of Wing Commander. Q: Were you shown elements from the game to help with the scoring? 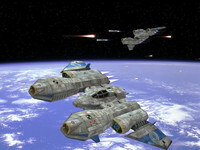 A: Yes, we saw most of the characters in the game, especially the aliens, and several animations. I was even allowed to read the script. We recorded the tracks at Origin headquarters in Austin, Texas. 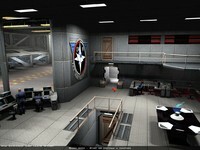 We decorated the studio with pictures of the aliens and the space ships of the game. Great designs. We were surrounded by aliens to write the music. Q: On a year by year comparison, the video game industry makes more money than all of Hollywood's films combined. 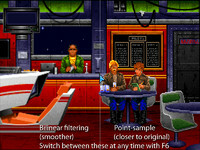 Do you think there could be a new audience for you hidden among the players of Wing Commander V? A: Might be. But frankly, this isn't really my first concern. 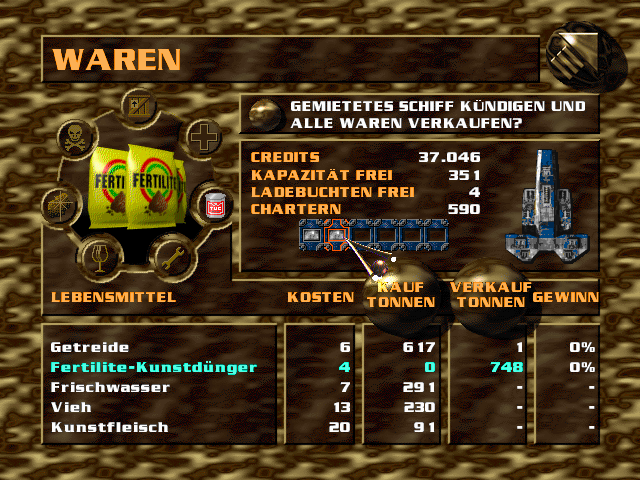 I think the music fits the game really well, and it was fun to do it and to be part of the making of Wing Commander. This is what counts for me. 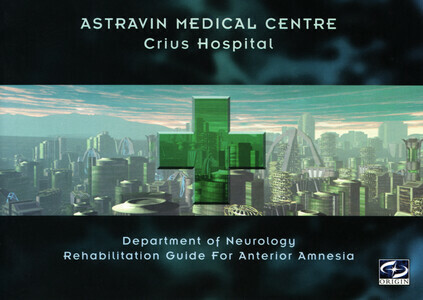 If this soundtrack can generate more public interest for Cobalt60 it would be really nice, but this is not the main issue for me, at least way less than it is for my record company. Q: Do you play videogames at all? A: Yes, and since a long time. I peculiarly like operating submarines and attacking convoys at night. A new build of OBJ2WCP has been released! 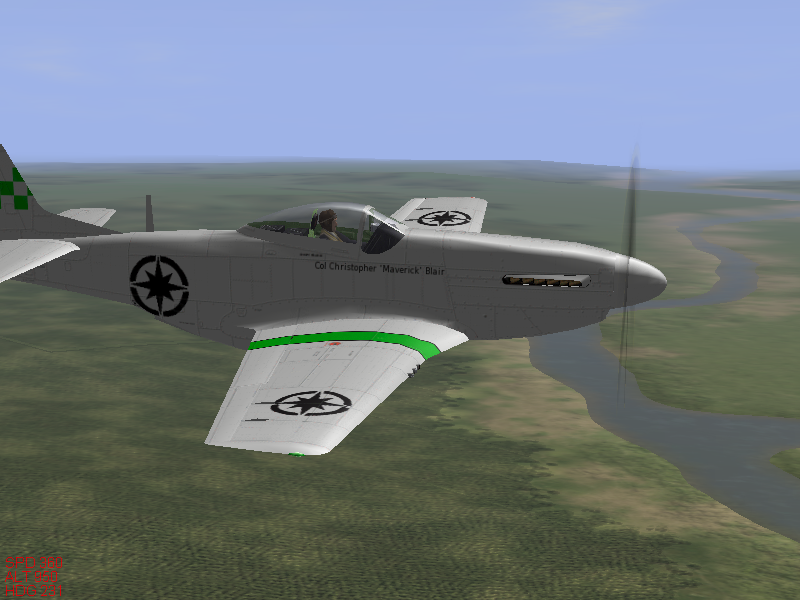 Kevin Caccamo got some fancy equation help from gr1mre4per and has published version 1.2 to fix some rendering issues. 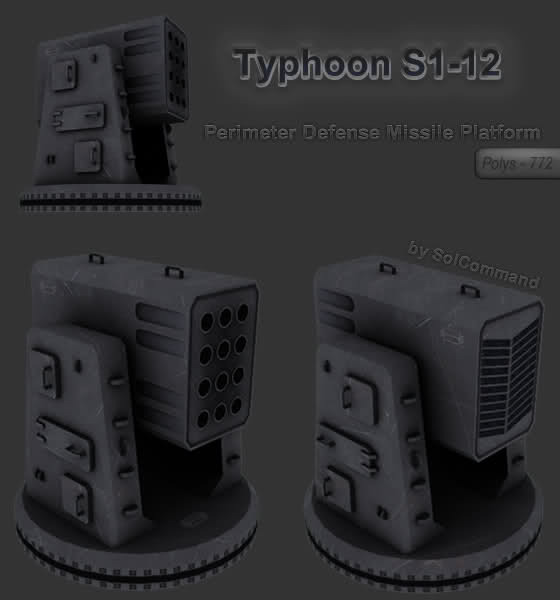 The tiny app is available here (15 k zip), and instructions are included. Happy importing! OBJ2WCP is a model converter which reads OBJ models and outputs PAS files, which can be compiled into WCP/SO format IFF meshes with WCP Pascal. 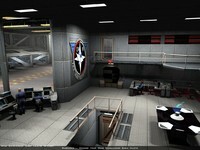 The German Wing Commander hub Wing Center has been overhauled for 2011. 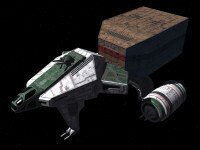 The site features news and forums for Wing Commander fans who speak German. Previous news in their archives goes back to 2007, and they are also working on building up a database of WC info. 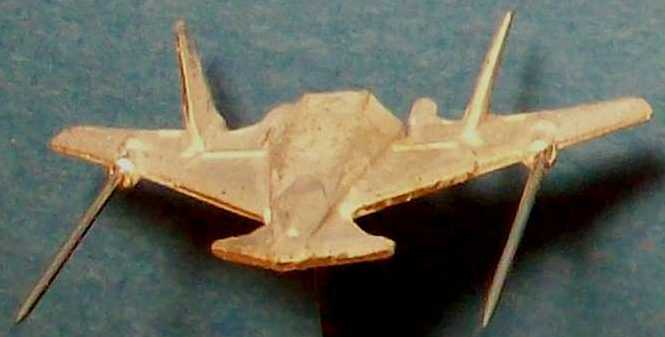 It was originally launched almost ten years ago. 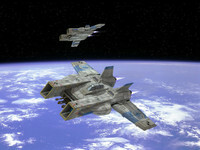 You can find them at www.wingcenter.net. Wir wollen mit unserer neuen Website erreichen, dass sich jeder zu Hause fühlt und das "Wing Commander Universum" mit all seinen verschiedenen Facetten versteht. 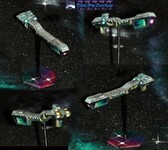 Frontier - Prelude to Darkness has spawned a spinoff. WCblitz has begun putting together a comic adaptation of the animated movie. 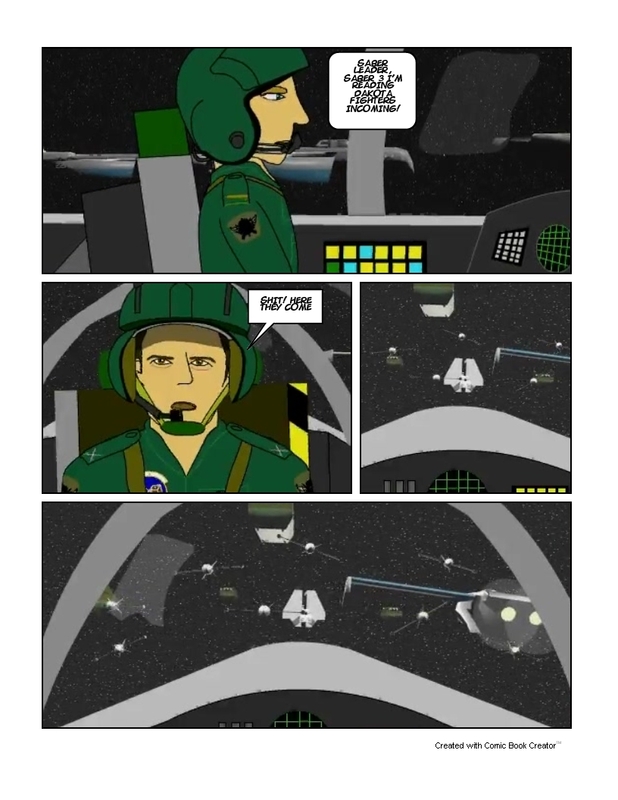 The pages below are just test frames, and the real deal should be released in a presentable story format. 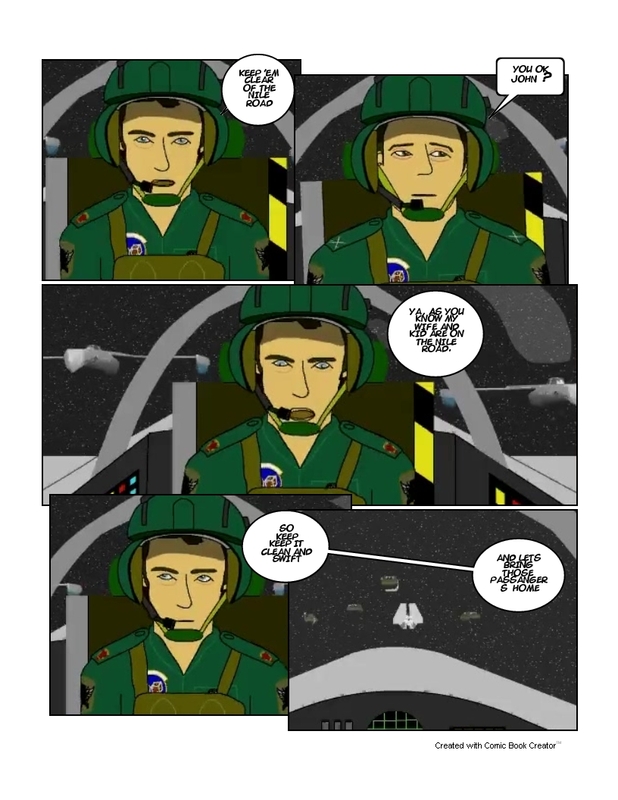 Comics are fun, and hopefully we see more Wing Commander themed ones this year! Hi, all Blitz here (Saber 3 and Lt.Hogan of Frontier). Thought I'd give you a little sneak peak of something I've been working on for a few months. 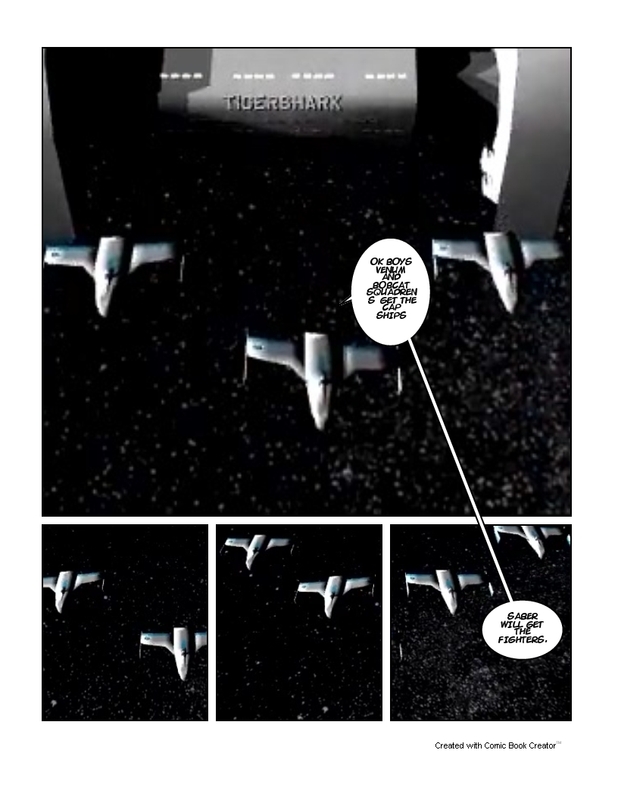 A comic based on the Frontier Prelude to Darkness film/chapters. 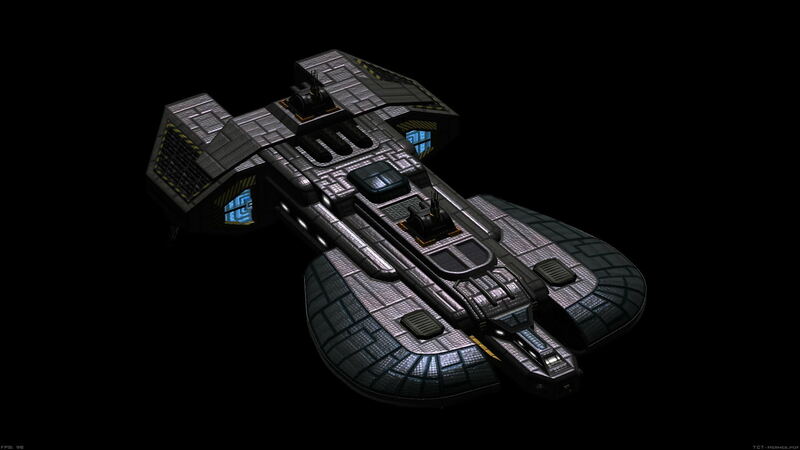 ScoobyDoo has posted a huge batch of wild and crazy Wing Commander ships! They should all look familiar at first glance, but upon closer inspection, many of the ships have creative offshots and stylings. 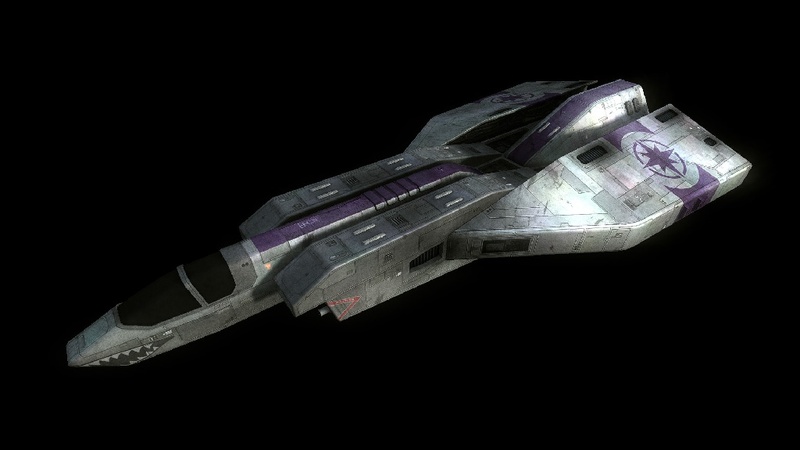 Some of the more classic designs have a greater metallic tone, and some of the younger ships have intakes and elements borrowed from older craft. It's quite a beautiful mash-up! 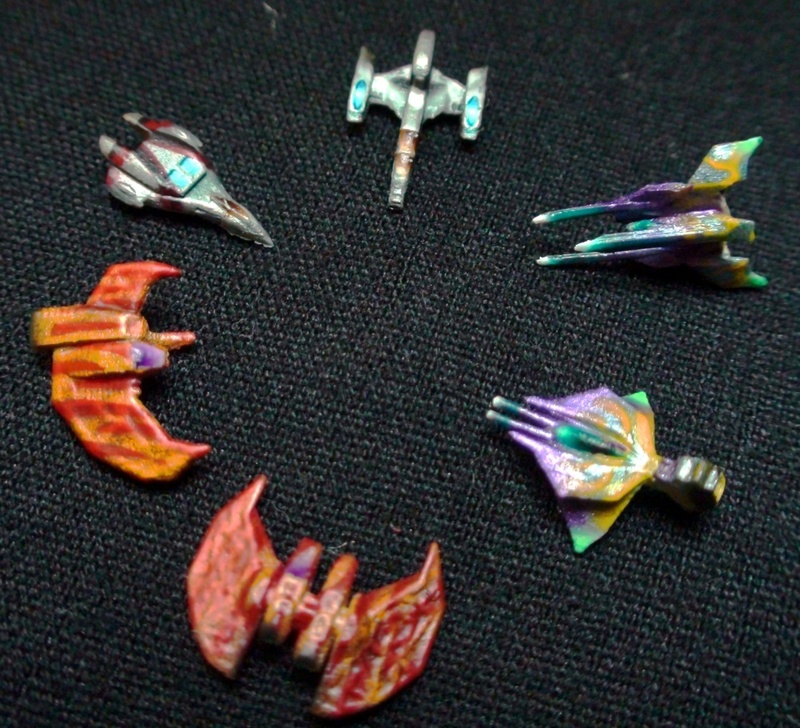 Just in case the deviations throw you off, here are the inspirations from each ship from left to right: Epee, Devastator, Demon, Crossbow, Ogan (! ), Bearcat, Longbow, Excalibur, Gladius, Heretic and Errant. They come for quite a few different sources! You can let Scooby know what you think over at Crius.net. The Fatman wanted to remind everyone that Maz Sound Tools is still taking preorders for Immortal 4, an awesome upcoming album full of classic game soundtracks. Dozens of familiar tunes have been remastered, including Wing Commander music with drums played by original composer Dave Govett! Preorders are just an interest check (payment is not required), so head over if you plan to pick this up! 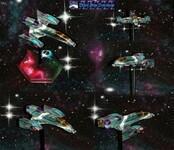 TheMightyFatMan: You can preorder game music CD "Immortal 4". http://www.maz-sound.com/Immortal/ For live Team Fat Wing Commander and Lemmings and more! 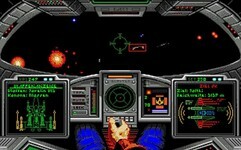 Electronic Arts' XBox Live sale kicks off today, although it is sadly lacking a discounted Wing Commander product. 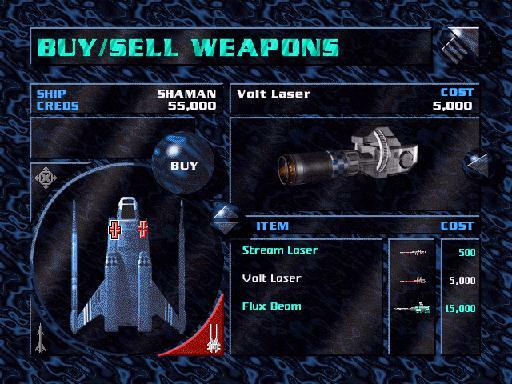 Everything on the sale list is a relatively recent release, so other popular games such as Boom Boom Rocket are similarly excluded. 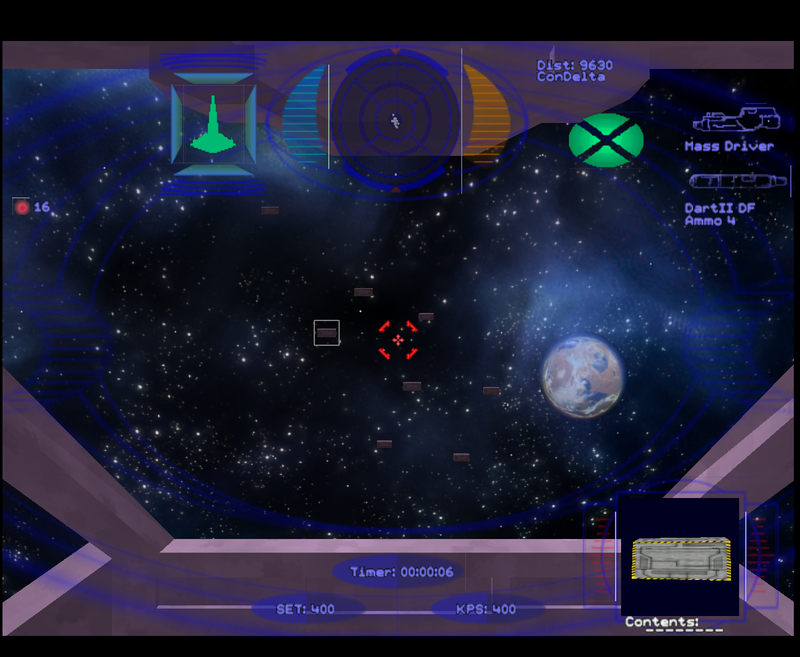 The good news is that Wing Commander themes are still available for under a dollar! It has been a super busy month for the team working on the WCPedia. Dundradal has a goal of doubling the size of the encyclopedia in 2011, and they're well on their way to accomplishing that. 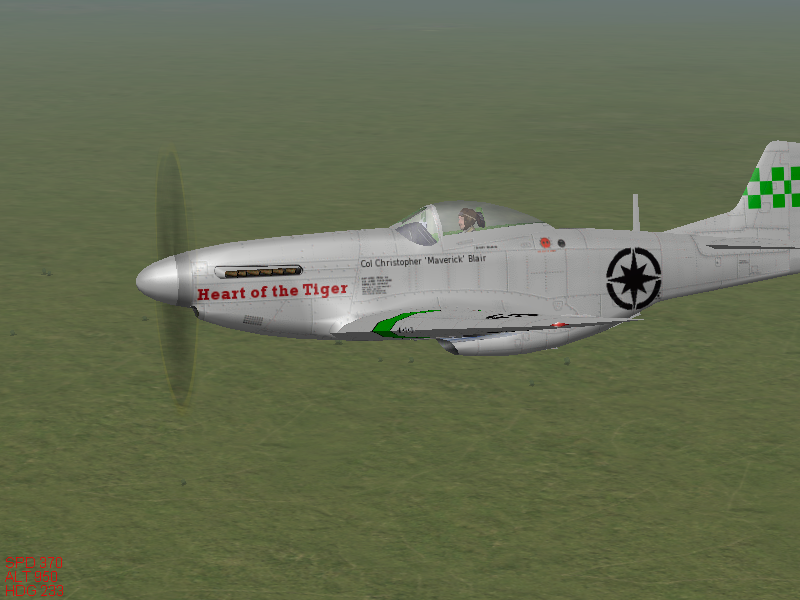 A huge new addition is the inclusion of the Memoirs of Lieutenant Colonel Carl T. LaFong, The Kilrathi War's Greatest Ace. 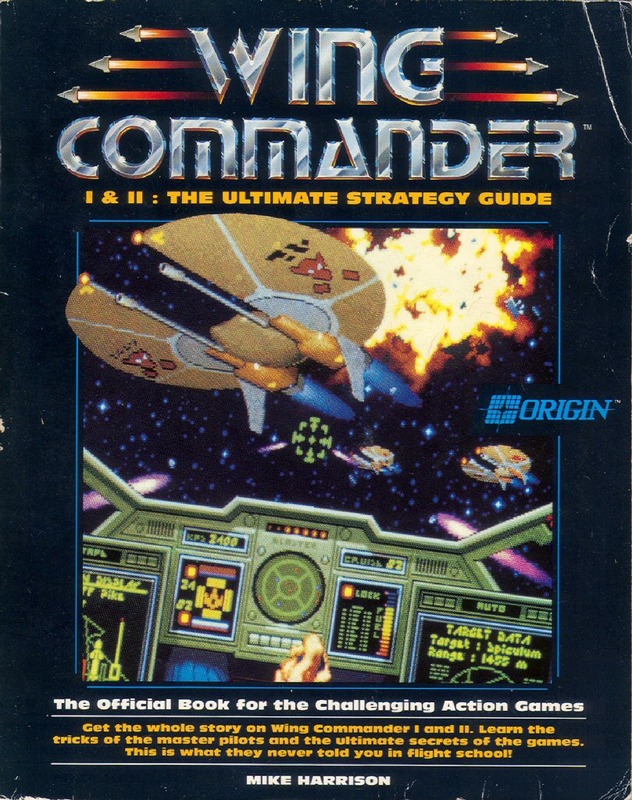 Text in these entries comes from the narrative-driven Wing Commander 1 & 2: Ultimate Strategy Guide, and they significantly flesh out the missions of the original games. 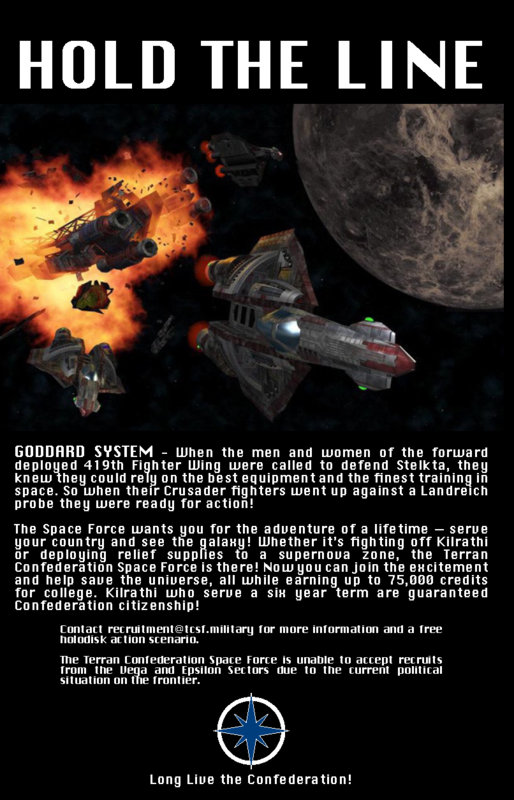 On the other end of the timeline, Privateer 2's Bulletin Board Missions are also being steadily filled in with mission details and relevant story elements, which has already brought a ton of obscure and exciting trivia to light. You can help build the WCPedia here! Hit the Discuss link below if you're not sure where to begin and would like to talk directly with the team. WCPedia has already had a very busy 2011. LOAF has done some great work in adding Priv2 Bulletin Board Mission articles. He's also put together a temp skeleton of every mission in the WC universe. 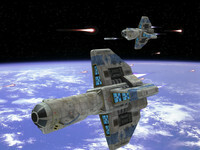 We are currently in the process of working through this list and adding mission information. I'm continuing through the Ultimate Strategy Guide text and LaFong's memoirs are almost finished. By the end of the month, WCPedia should contain more than 1,450 content articles. That means we've added over 350 new articles since August 10 of last year. Dozens of articles received massive updates and rewrites in the same period. I'm hoping we can still make my goal of doubling the size of WCPedia (roughly 2,200 articles) by August 10, 2011. "Fight the good fight, Heart of the Tiger." Another year has come to a close, so here are the winners of our annual contributor contests! A quickie correction: we've mentioned a couple times that this is the "tenth annual" polling, but that just refers to the Fan Project of the Year question. The Web Site of the Year award has been around for twelve years now. Here are the picks for 2010! 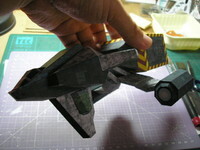 The 2010 Fan Project of the Year is Astro Commander's Mini Models! 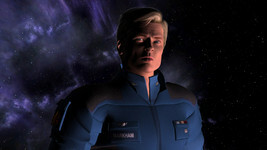 Astro's adventure started later in the year when he came to the CIC looking for information on how to obtain physical Wing Commander ships. After learning there was no readily available source, he got busy and found his own way to make this happen! 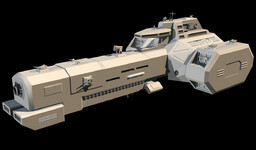 Work started with 3D models and then a rapid prototyping service was found to "print" the ships in plastic/resin. 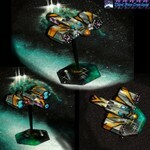 The designs were made available for others to purchase at cost, and Astro's own airbrushed craft are gorgeous. 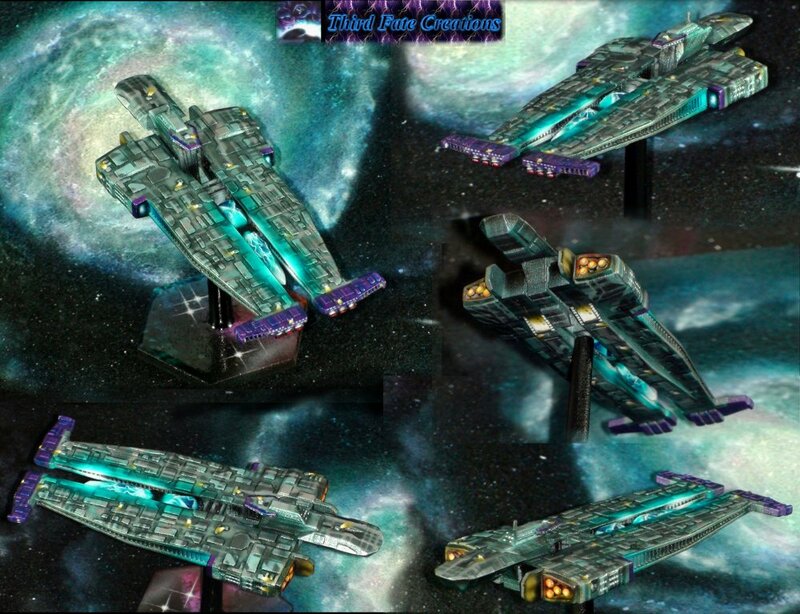 A massive fleet of ships is now available. The runner up for Fan Project of the Year is sol_hsa's DirectDrawHack. 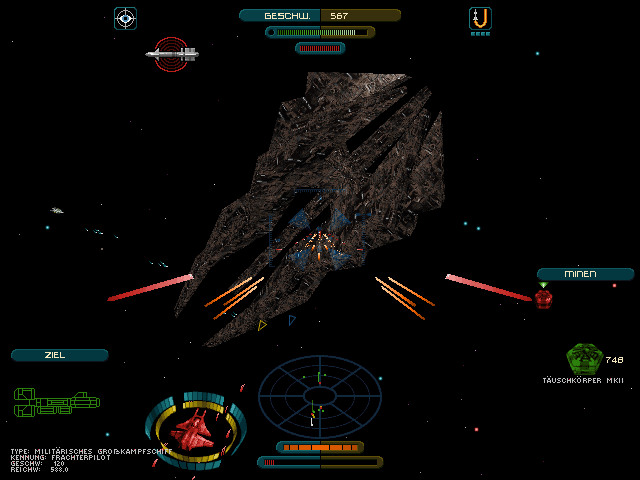 The project began as a simple graphical tweak to WC1 in Kilrathi Saga, but it soon grew to encompass all of the Kilrathi Saga, the Windows edition of Wing Commander 4 and the PC Gamer WC1 Release.. Several different graphics-enhancing options were developed, and the patch even fixes some harrowing bugs and compatibility issues. 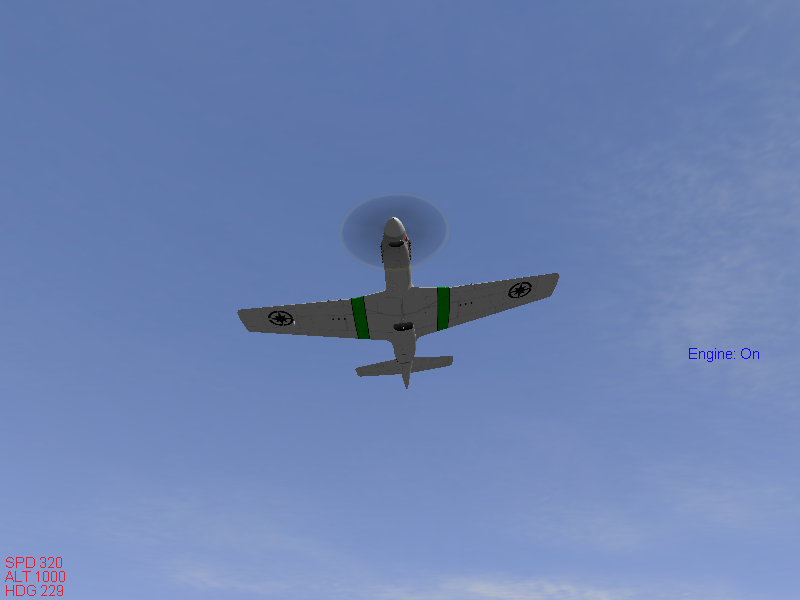 Finally, the source code and debug tools were posted online for all to continue troubleshooting and expanding the program's features in the future. 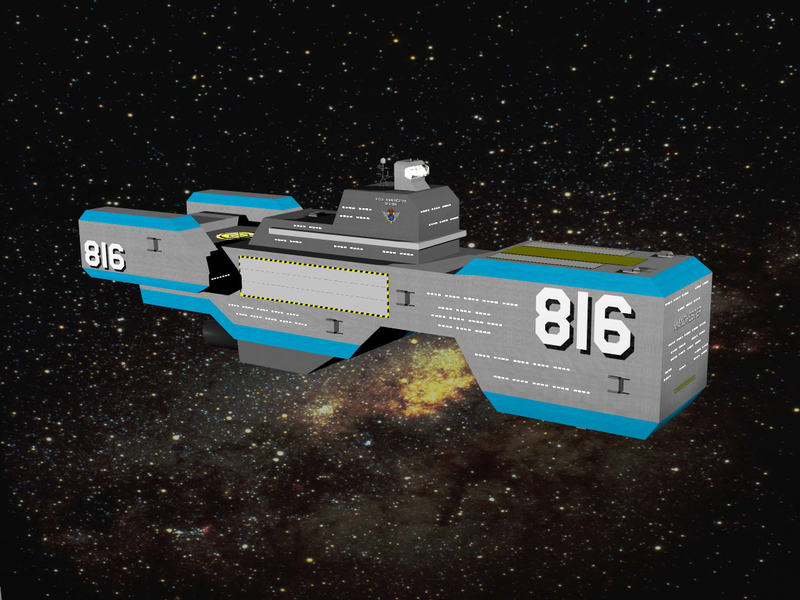 The 2010 Web Site of the Year is Paper Commander! The site had clever and crafty releases in the beginning, middle and end of the year, and new 2011 designs are already coming out. 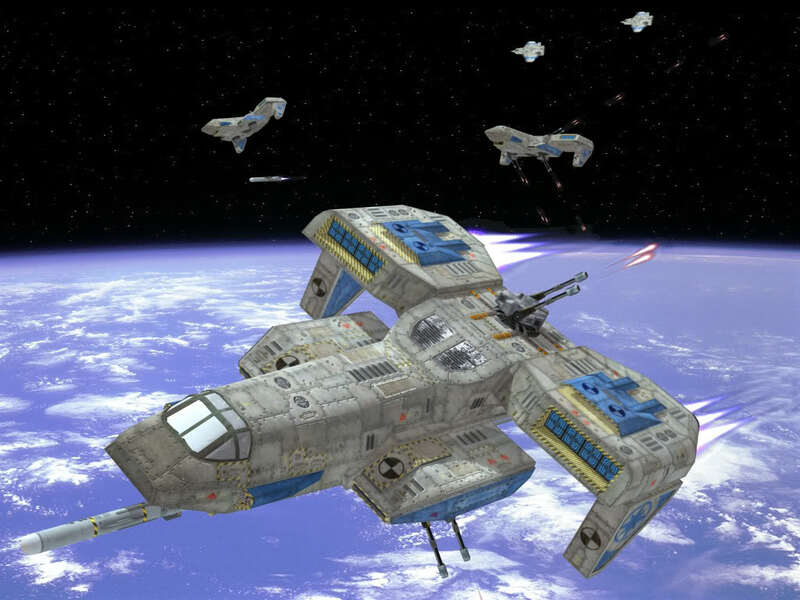 One of the most impressive things is always the breadth of the Wing Commander series that the site covers. 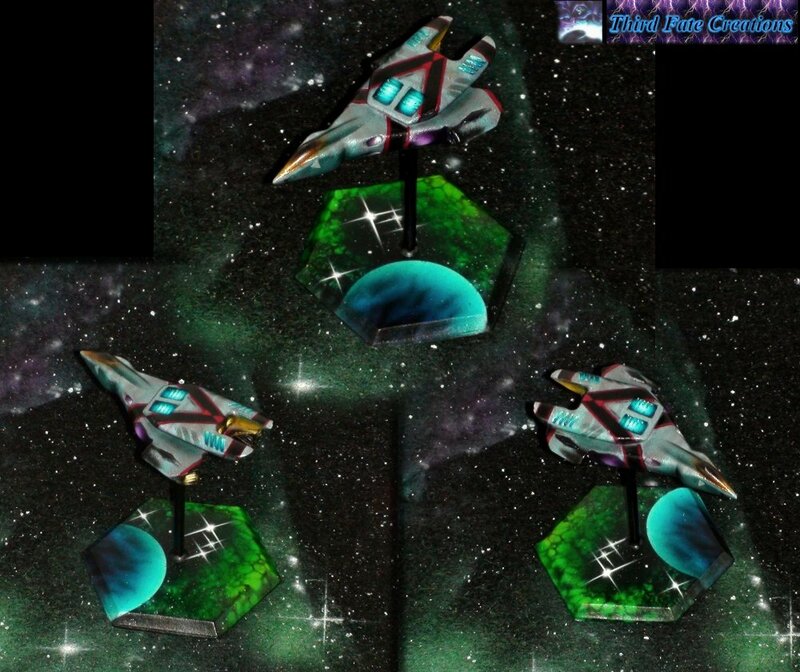 Rather than focus on any one game or timeframe, Paper Commander hits everything from Wing Commander 1 to Wing Commander Arena, with ships even coming from Super Wing Commander and Armada! And anyone with a printer can start building now! 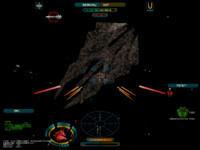 The runner up for Web Site of the Year is Frontier - Prelude to Darkness! While the story and setting itself is an original creation, the style and character of the fan movie are heavily inspired by Wing Commander. Many WC fans voice a variety of characters and make suggestions on how the serial will evolve. The project's website is particularly attentive to fans with frequent status updates, questions for its fans and behind-the-scenes features posted regularly. Congrats to all the winners! Every nominee received numerous votes and brought much credit to the community over the last year. Thank you all for the hard work, and here's looking forward to a fantastic 2011! Last month lew82 asked if he should continue making new chapters in the Frontier - Prelude to Darkness series or devote time to the high definition/quality remake. The response was overwhelming tilted towards continuing the story, so that's the direction the movie will go next. 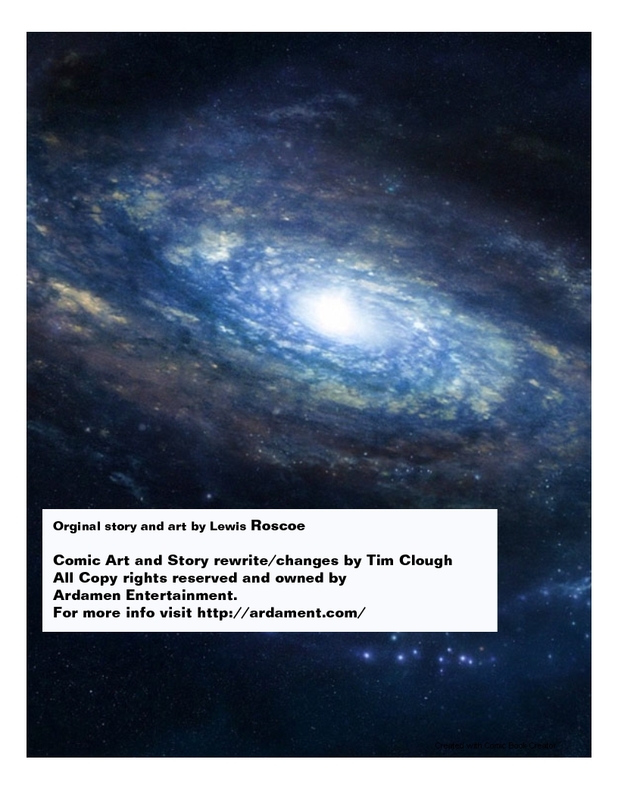 Chapter 1 (Part 1 & 2) will be released in HD before long, but for now, work on Chapter 14 continues. 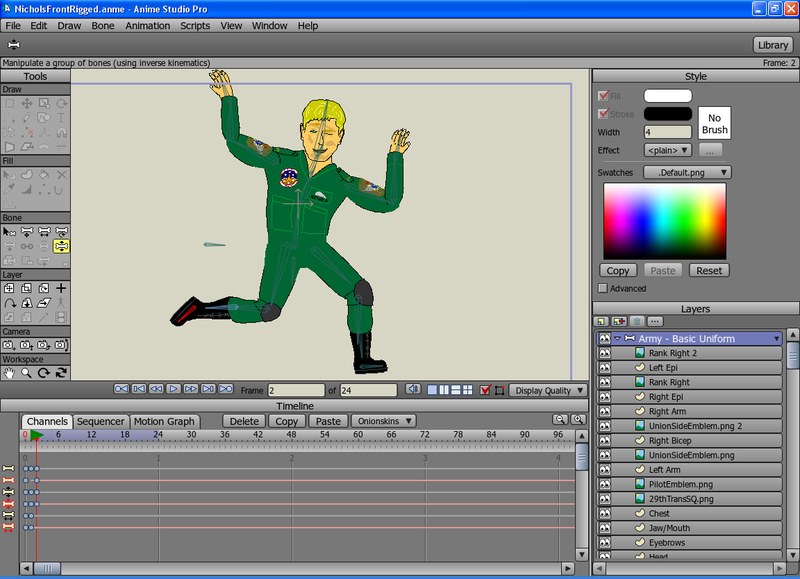 Here's a behind-the-scenes shot of character animation in progress. 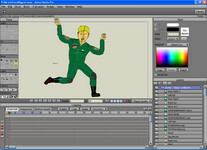 Welcome to 2011 everyone, it’s been a great start so far, presently we are working on the 3D Models for Chapter 14 (Dakota Village, Ship Interiors, etc) and also converting over all the 2D Characters to Anime Studio Pro, which can be slightly time-consuming when you consider that all the main characters need to be redrawn onto this new program, but the end results are worth it, when you can now have not-so-robotic facial expressions and movements. Winners in our annual contests will be announced in the next day or so, so now's your last chance to vote! If you were undecided before, head over to the voting page and make up your mind. There are lots of deserving nominees, and it's hard to just pick one in each category! Wingnuts can now vote for one pick in each category: Fan Project and Web Site of the Year. 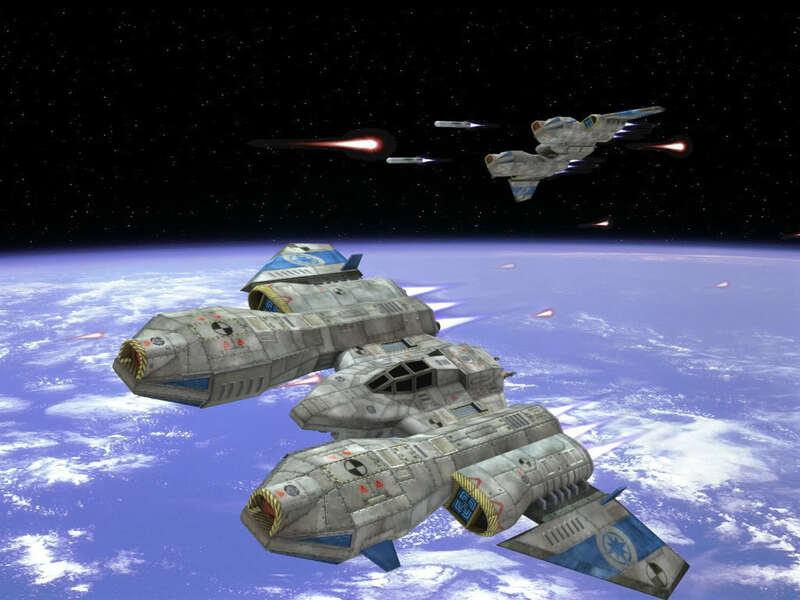 Things to consider include how big of an impact each undertaking had on the community and their sustained commitment to being Wing Commander fans. Of course, there were many daily contributions by many different people over the last year, so feel free to hit the comment button if you'd like to acknowledge anything that didn't make the cut. 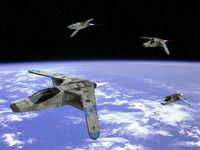 MartySheen spotted a cool Wing Commander mention on today's MSN UK page. 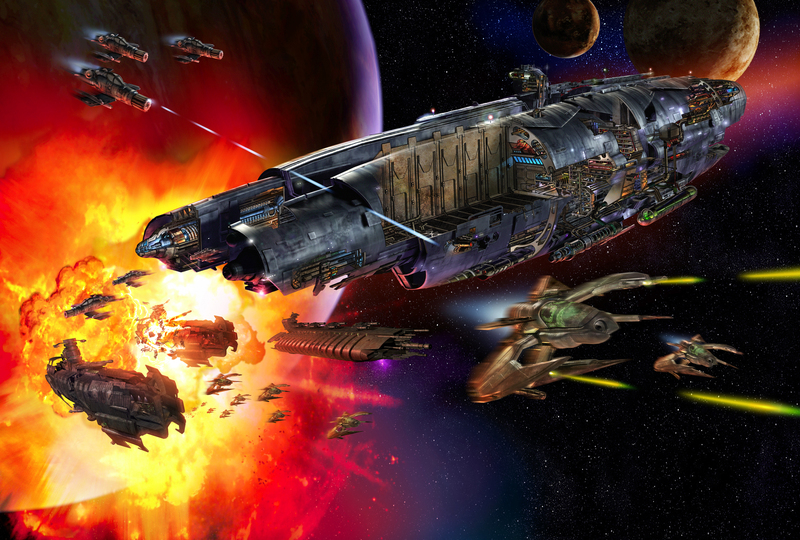 The gaming section has posted a feature on games that desperately need a sequel. 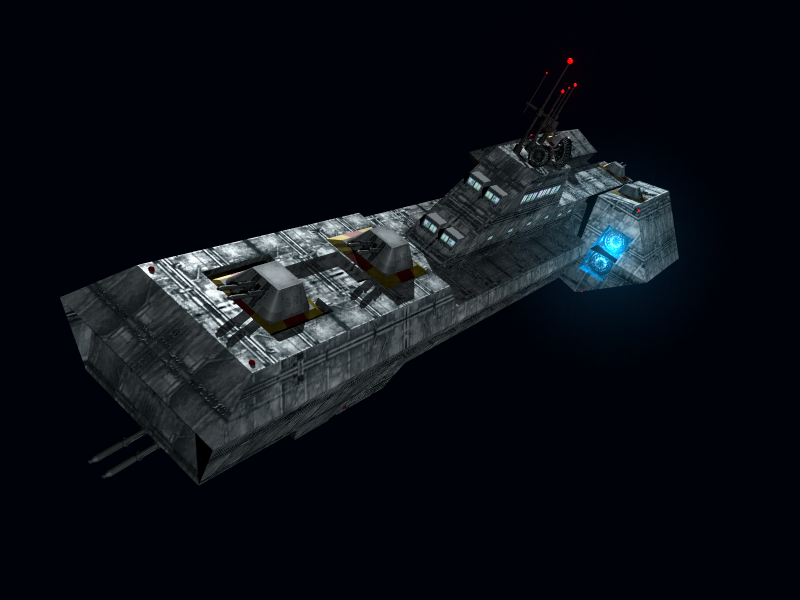 They acknowledge that space sims are few and far between lately, but their editors still hold out hope for a new WC. 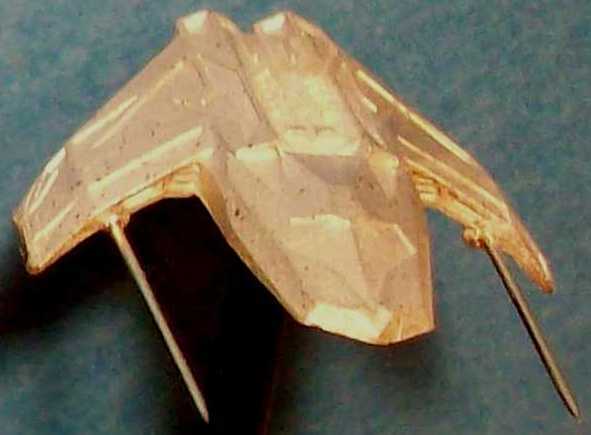 It also looks like some inspiration for the mention came from the recent UGO article. You can check out the whole feature here. It seems that in recent years space sims have gone the way of the dinosaur. 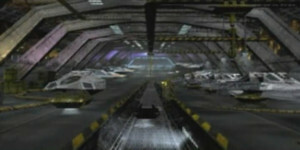 But a new entry in the Wing Commander logbook could do what the Battlestar Galactica reboot did for sci-fi TV shows. 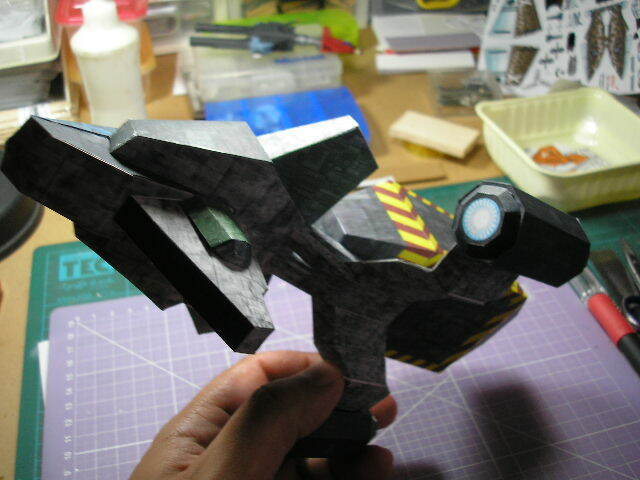 SolCommand has built more models for fan projects that need some extra digital muscle. 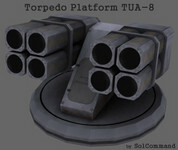 His latest batch includes several different types of turrets for mounting on large ships. 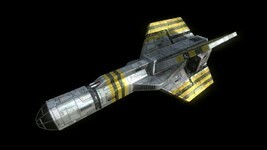 You can also go through his archive for a vareity of different sci-fi designs. 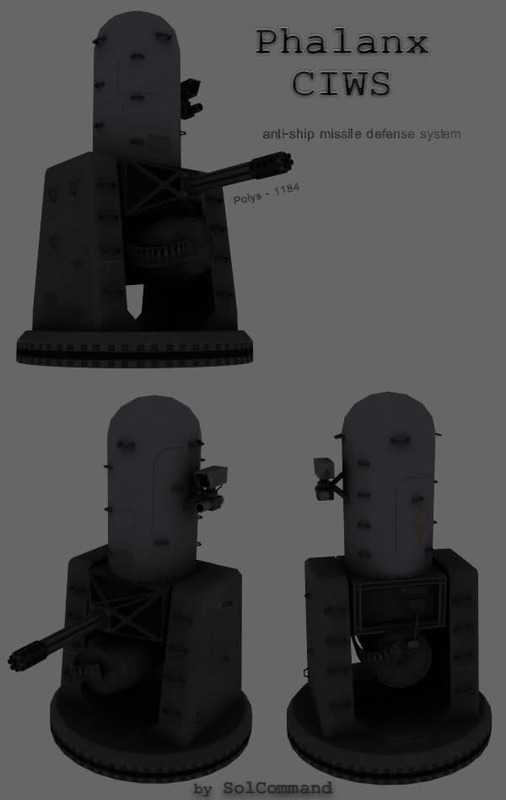 Thought it would be cool if I give all these models to the community, maybe someone will find a use for some of them. 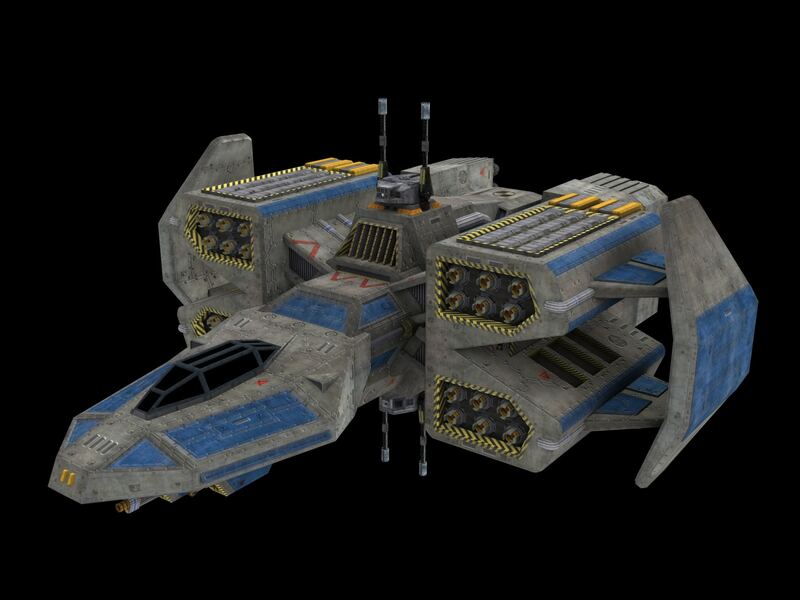 Anyway I released my models for public download on another Freelancer community website (The Starport) and since then I've created some more, some even textured. I hope my gift for you and all the hard I put in these models will be appreciated. There are about 70 or more models available for download, most are WIPs and they're in 3DS and OBJ format. You can use them for any mod/game you wish. 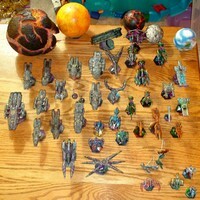 Here's a giant new photo of Astro Commander's miniature fleet. 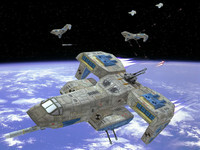 It includes all his recent designs: Battlestar Galactica ships are clustered in the lower left and Wing Commander ships are in the upper right. 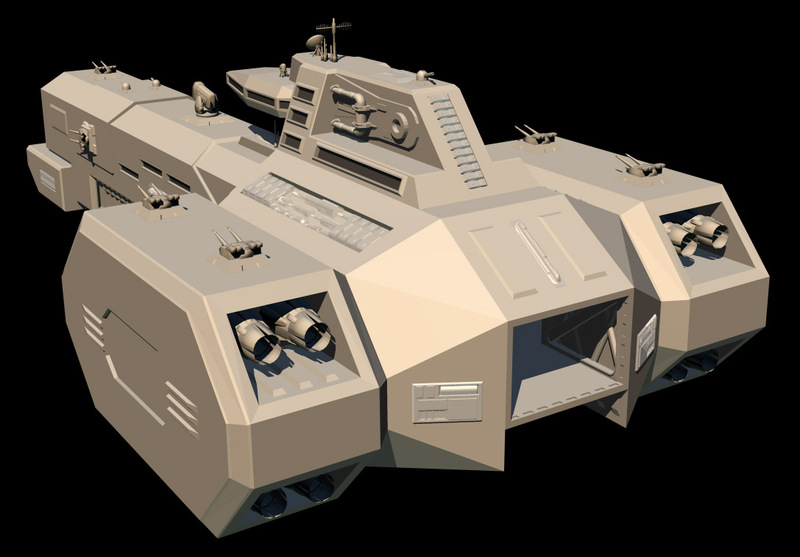 There are several never-before-seen ships, including the Intrepid from WC4, Tiger's Claw from WC1, a Snakier and several mid size Confed & Nephilim capships. 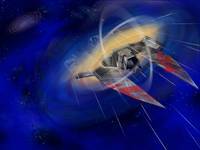 There's even a representation of a Tiamat Dreadnought emerging from a Nephilim wormhole - very clever! Astro will be participating in a Wing Commander themed tabletop wargame on February 19 at Genghis Con in Denver. You can find more information about that here. 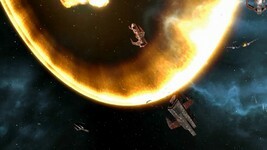 WC Saga has released the trailer video for the German language version of their upcoming Freespace mod. 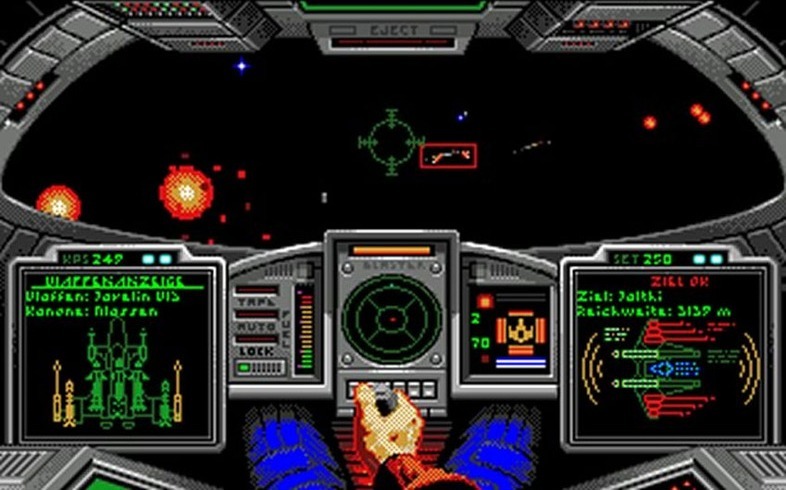 Wing Commander has always has a huge fan base in Germany, and multiple members of the game's development team are located there. 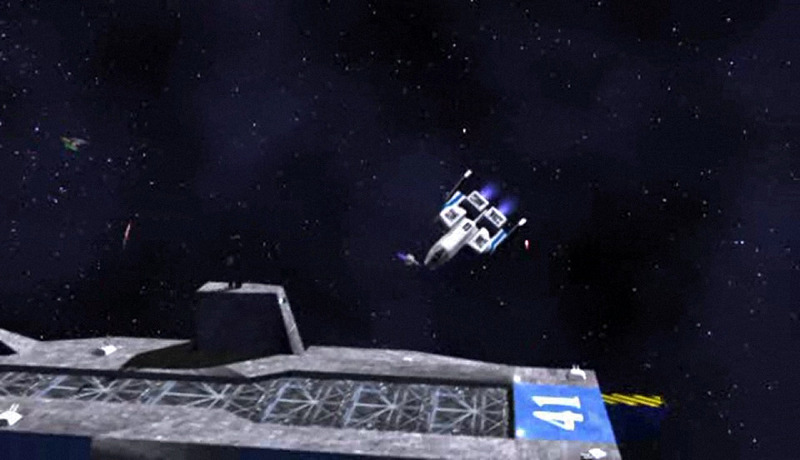 The new trailer can be found here. English speaking fans can find the previous trailer on YouTube. 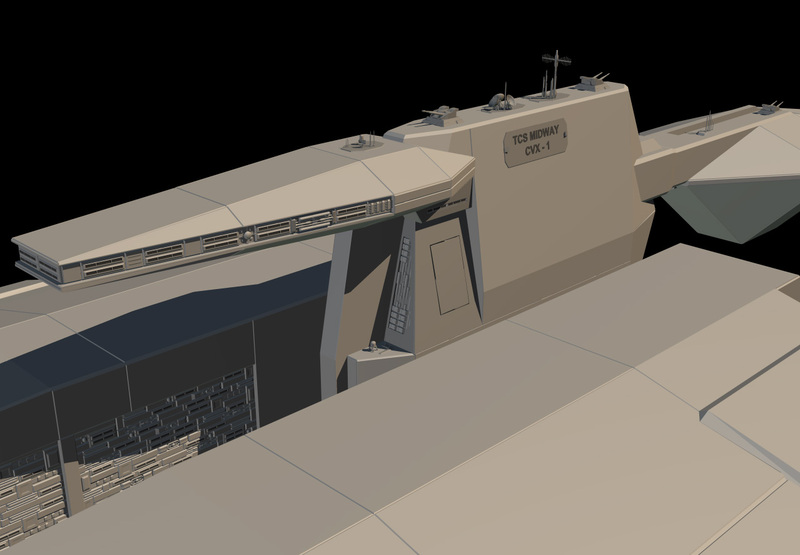 2nd Lieutenant David "Sandman" Markham's training took a cruel twist when his training carrier, the TCS Wellington, was ambushed and destroyed by the Kilrathi while cruising in a supposedly safe system. Unlike most of his fellow trainees and trainers, Sandman has survived to fight another day. But the days ahead are dark and foreboding. 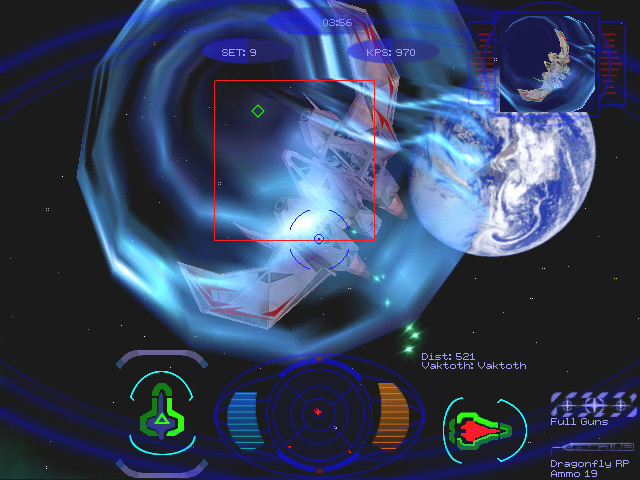 Are you set up to get ground-breaking Wing Commander news as soon as it happens? In addition to following the WCNews.com front page or the RSS feed, you can sign up at the CIC's Facebook Page! When the next big story hits, the news will be cross-posted to Facebook, so you can get your Wingnut on as soon as possible. It's also a good place to see cool updates that you might have missed and occasionally catch some material from behind the scenes. You can follow the CIC here. 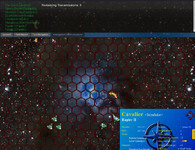 Ascii Sector announced that it will eventually be spun off into its own universe, but currently continues to get frequent bug fixes and impressive game updates. Astro Commander's Mini Models. The base 3d printed designs are available to order, and Astro's painted fleet is amazing. 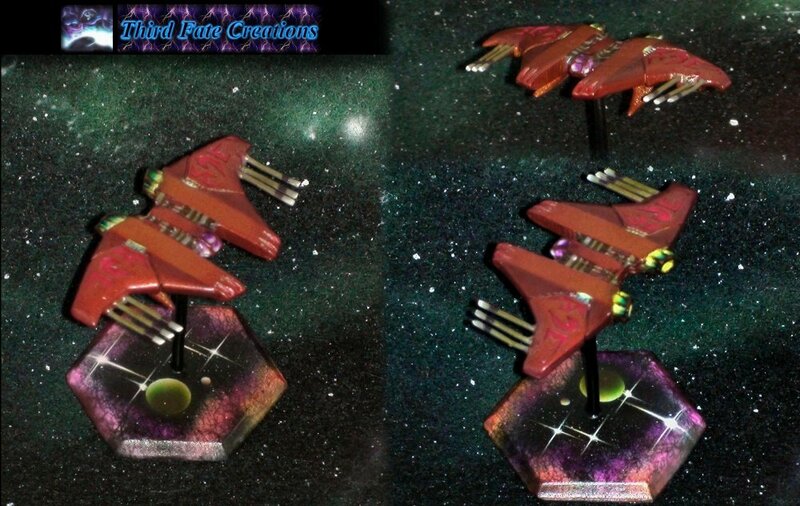 elend's Banshee is full of gorgeous detail and is one of the finest Wing Commander models ever made. Lin Kuei Ominae's Privateer 2 Editor wowed P2 fans with its plethora of customizable options and breathed new life into the Tri-System. Mincemeat's Superpatch fixes a host of lingering Windows compatibility issues and even works with the WC1 release. sol_hsa's DirectDrawHack program also works with the recent WC1 release, but instead of getting the games working, this program beefs up the graphics of Windows based WC games. 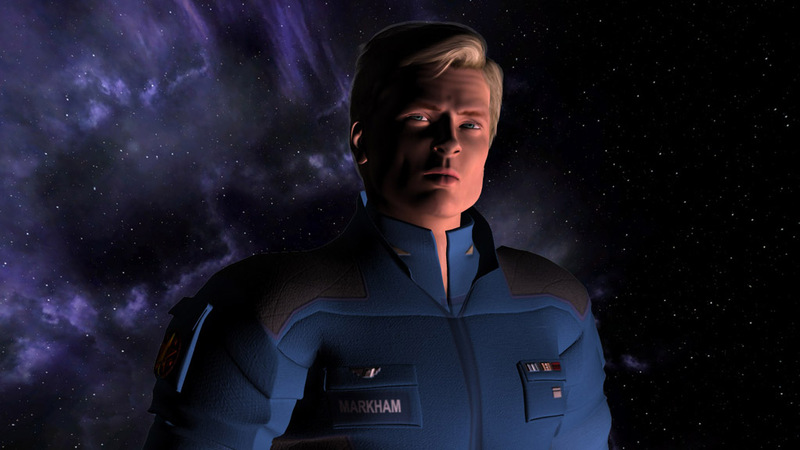 Frontier Prelude to Darkness is a Wing Commander-inspired animated movie with a website that's constantly updated with status updates, behind-the-scenes bonuses and special features. 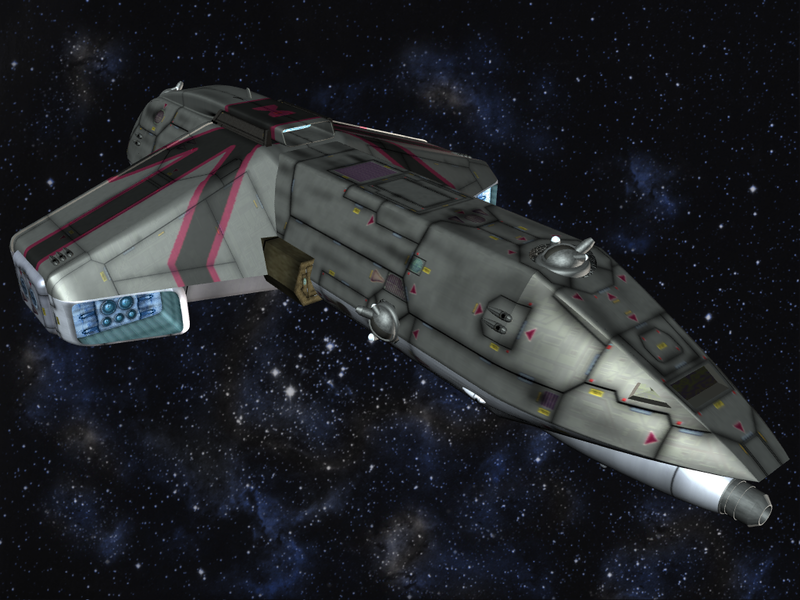 HCl's Wing Commander Editing Site relocated to Solsector this year, and HCl continues to pump out dazzling Wing Commander hacks and extractions. Paper Commander had a big year with five fun new paper ships to build. 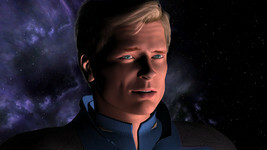 WC Saga continues to post new updates about the pending release of 'The Darkest Dawn'. Wedge's Wing Commander is about as reliable a source of Wing Commander info as you can find anywhere on the internet. 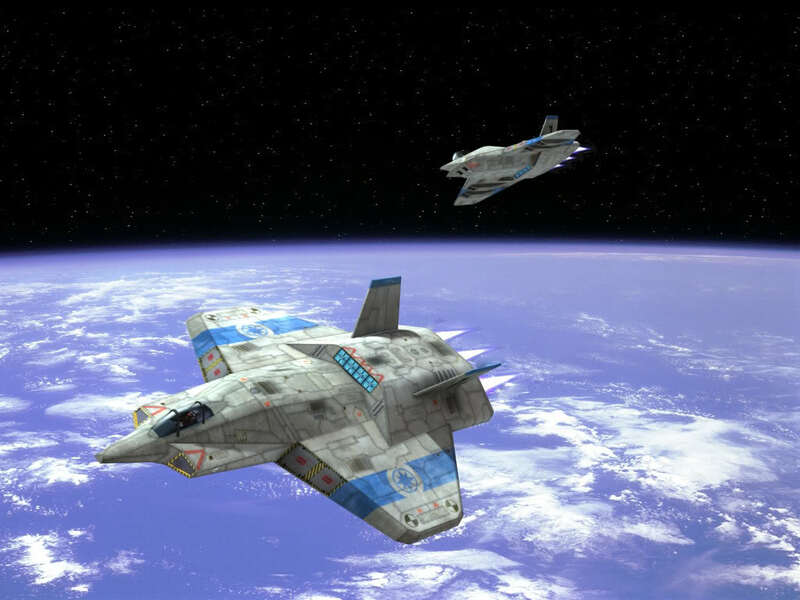 Wing Commander Tactical operations has both a web presence for its offline games and a budding test environment for its exciting online version. Industry Gamers has conducted an interview with EA CEO John Riccitiello, who has some interesting things to say about digital distribution of games. His direct prediction is that by the end of the year, digital sales of games will exceed boxed retail sales. He also has a lot to say about microtransaction and alternate play models as well as continuing to offer games on a wide variety of platforms. Check out the full article here. 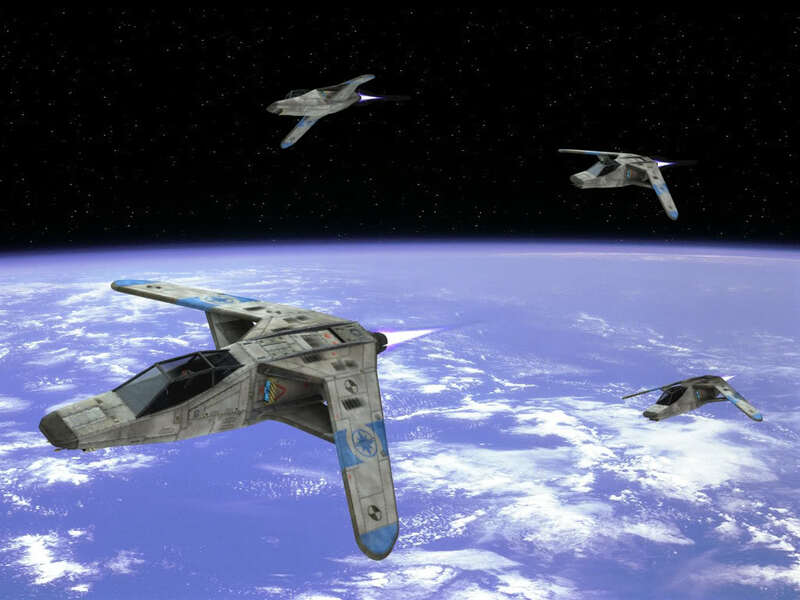 The free-to-play model has been a huge boon for EA. 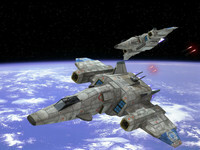 Riccitiello noted, "Our highest ARPU (average revenue per user) are free-to-play games among paying users. You think about that and say, 'how can a free game be the game they pay the most for?' We have people who are giving us $5,000 in a month to play FIFA Ultimate Team. And it’s free. Dirty little secret." The key for publishers is to be flexible, he added. "I actually don’t think that there’s a lot of mileage in trying to decide exactly how consumers want to buy their entertainment content. They may want to buy it on an iPad; they may want to get it through the social network, they may want to pay for it through micro-transactions and monetizing, or they may want to pay for it all at once. They may rather pay a subscription price in order to count on what their costs are going to be, but they may want to pay for it all at once and never have to pay for it again. We’re in all of those businesses and I think the way this is going to work is that the models that the consumers like the most are going to grow the most," Riccitiello said. 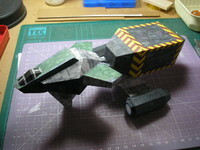 Paper Commander's first model of 2011 has been released! The classic WC1 Drayman is ready to download, print and build here. 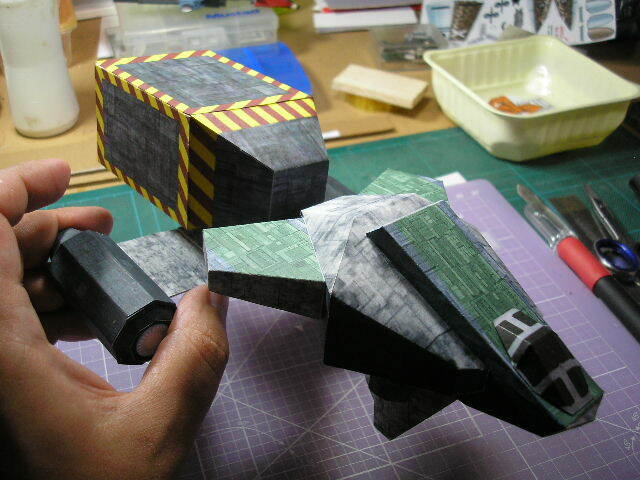 It looks great, and if you've never built a paper model before, Péricles says this is the one to start with. 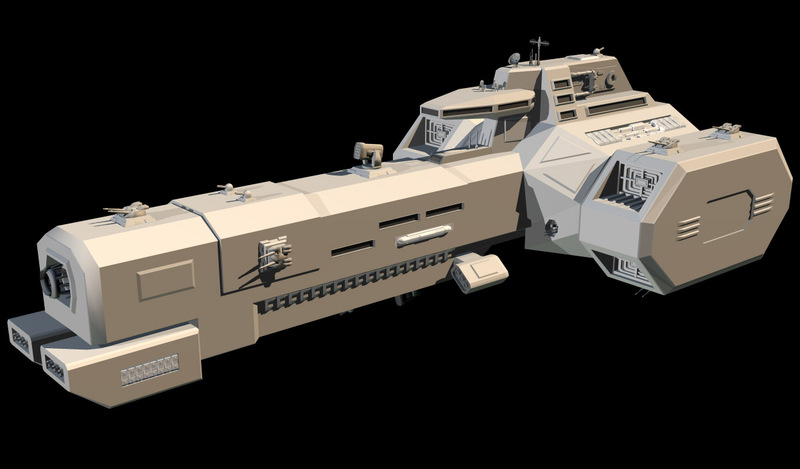 For those who saw the paper Drayman above and can't get enough of the storied 'sport, here's a look back at one of Howard Day's impressive 3D models. 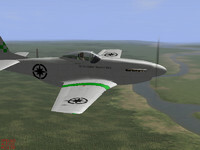 It was released in 2005 and require F-edge and Max6 to manipulate. The ship is available to download here (2.5 meg zip). Avacar has finished the 'Field Reports' feature in the online version of Wing Commander TacOps. Previous iterations of the end-of-turn results were most recently represented by big blobs of text, but the new summary is concise and color coded. A static example of typical turn results can be found here. 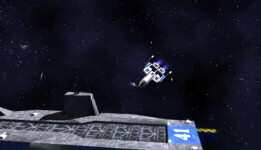 The test team's ongoing game progress can be observed here. Opinion time! I finally finished the End-Phase Field Report (aka what happened during Combat Phase) update demo. This is pure html/css for now, but I wanted your opinion on the readability. Colour/spacing/fonts/etc. See the static demo here. I'll probably update this page with the other 2 field report demos as we go. I know starting with this one is an odd choice, but it was probably the least clear of the three. 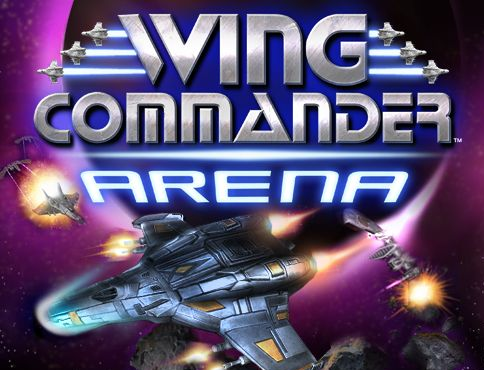 Major Nelson has posted a preview of the January deals coming to XBox Live, and the big news for Wing Commander fans is the Electronic Arts sale in week three. 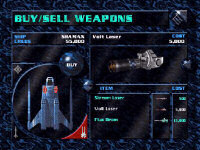 More than 25 different items, including full Arcade games, will be discounted up to 50%! 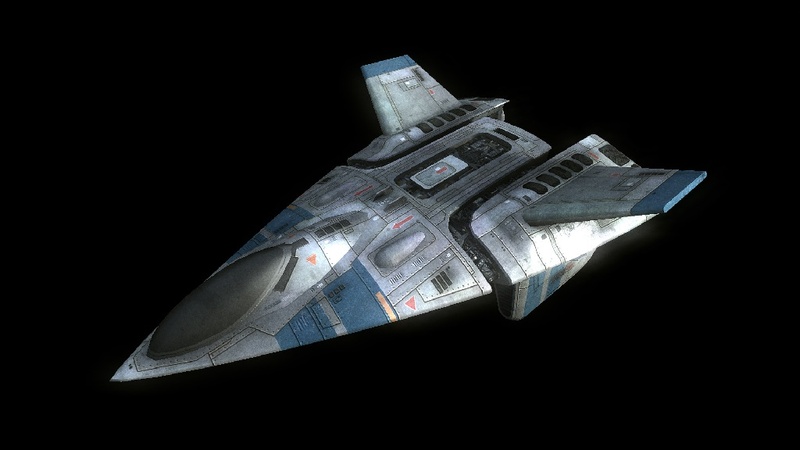 Hopefully, this includes Wing Commander Arena, since it could potentially bring some big publicity and quite a few new players to the Epsilon Sector. On top of the January 18-25 sale, XBox Live will hold a free weekend from January 28-31. Just in time for the 3.5th anniverary of Arena's release! Can you believe it's already been 3.5 years? From January 11 through January 17, enjoy a special one-time savings of up to 50 percent on more than 25 pieces of hot Activision content including Call of Duty Map Packs, Guitar Hero Add-ons, popular Arcade titles and more! Additionally, from January 18 through January 25, fans can enjoy a special one-time savings of up to 50 percent on more than 25 pieces of Electronic Arts content, including fun Arcade games and more! For details, please check your Xbox LIVE Dashboard on January 18. Deco Bryl tipped us off about Mark Dacascos' new role as the villain 'Wo Fat' in the remake of Hawaii Five 0. You can catch a brief behind-the-scenes clip of Mark at 50Undercover or view the recent full episodes at the CBS website. Mr. Dacascos has appeared in two episodes so far, "Ke Kinohi" and "Hana 'a'a Makehewa." Mahalo for all the support. I’m thrilled and honored to be playing Wo Fat on HAWAII 5-0. Excited to work with the excellent cast and crew. Mark Dacascos isn't just busy on TV. The Iron Chef, space fighter pilot and expert dancer also has a big role in a new movie, Sultanin Sirri, where he plays a big antiterrorist agent fighting in Turkey. AD found an article and trailer here. Everyone's favorite Iron Chef - not to mention a former Crow and cult favorite thanks to films like Drive and Crying Freeman - is headed to Turkey. Mark Dacascos has a key role in Sultanin Sirri, an upcoming Turkish action film. Dacascos plays an American agent in the picture which aims to provide a Turkish spin on the international espionage / terrorism genre and if the first trailer is any indication the production values on this are actually quite good. 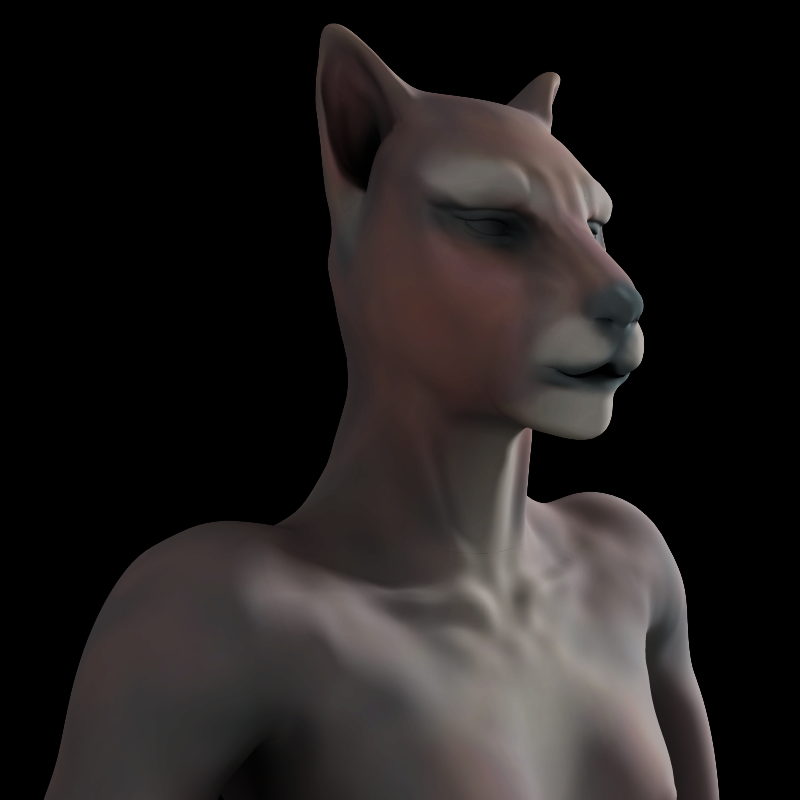 Michelle D has improved the facial structure of the Kilrathi priestess models, and these are substantially less creepy than the original design. The two sample images show the initial texture and then the latest attempt to begin with a photo and work backwords. 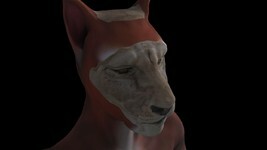 Added some more detail in zbrush 2.0 and blocked out the colors some. I wish I knew how to use alpha brushes without going into projection master. I don't like not being able to rotate and add detail at the same time so I just stay in the normal edit mode and use the default brush. (For the second image) I decided to forego using zbrush to make a fur bump and color map and decided to just use photographs and build a texture from that. 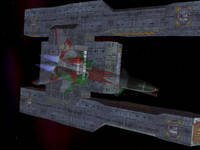 The aptly named 'Maniac' at GameXcess has posted a cool article on the top five videos of Privateer 2, a game chock full of wild and amazing cutscenes. 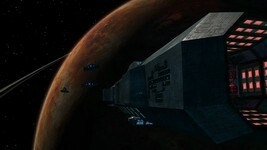 CIC Yellow already has most of the Privateer 2 cinematics online in high quality, but this exposure brings more well-deserved attention to the particularly unique setting of the Tri-System. Check out the top picks here. It’s time for another gamexcess.net Top Five video series. I’ve given this one a lot of thought, and you probably would’ve known it was coming if you check out our twitter feed, but this week’s top five is for the little known game Privateer 2: The Darkening. 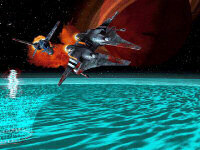 A classic DOS and Windows open universe deep space dogfight simulator. 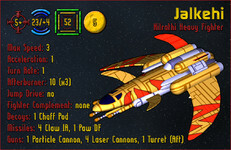 It was a serious precursor to games like Starlancer and Freelancer. It was also my first exposure to Clive Owen, as this was one of his first high profile American roles. He would later get a tremendous following during the BMW Films series (if you can find those anymore, enjoy) and later when he played the lead antagonist in The Bourne Identity. 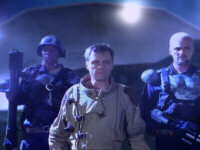 But more than just Owen, the game had Brian Blessed, John Hurt, David Warner and Christopher f'ing Walken, the later two responsible for delivering what is probably the greatest acted piece in the history of the world. 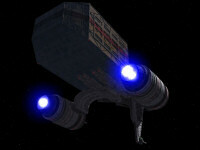 So join me as I take a look at the top five scenes in Privateer 2: The Darkening! Enjoy. Here's the second batch of Wing Commander models by Starman©. This is a pack of later year Confed capships: the Wake, Murphy & Midway, plus a cool size comparison. 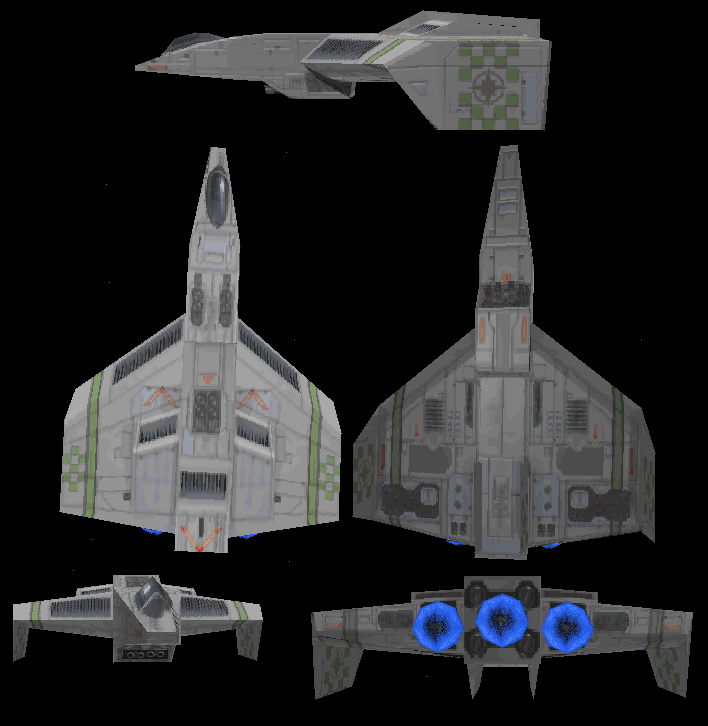 The 3D designs ended up being a little too detailed for use in a mod's game engine engine, so they're mostly for looks now. 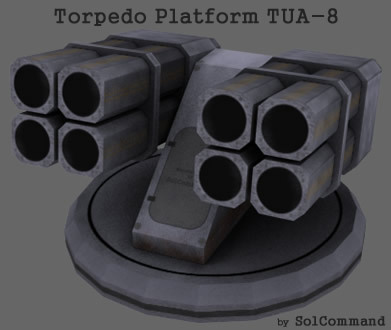 He's already got a little help texturing the UBW fighters, and anyone interested in assisting with these designs should head to Crius.net. 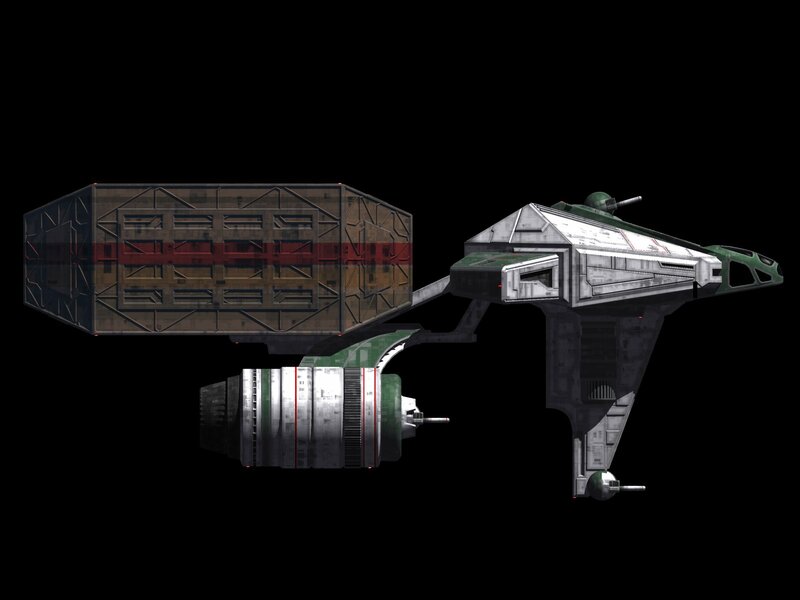 Midway: I took the model here on CIC as reference for some scaling. After doublechecking with the ingame model, I saw that I made the bridge nose to big. But I like it that way, so I left it. 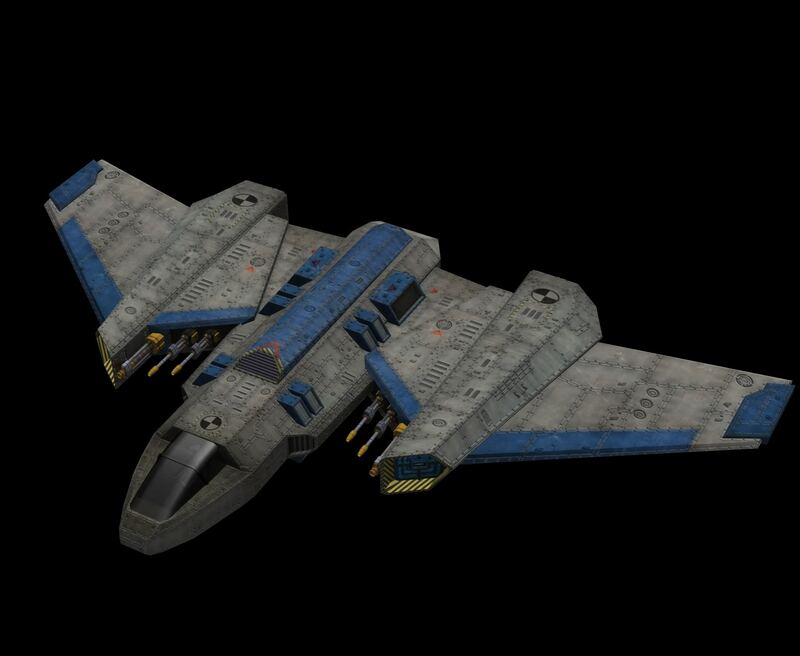 Also while rendering I accidently moved the connector part between both wings, so don't mind if it looks a little strange, it's not correctly centered. 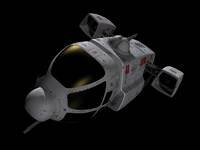 UGO has posted an article on the most dangerous future years from a video game perspective. 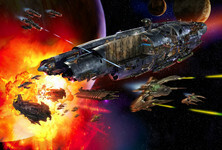 It starts in 2011 and continues through distopian futures and sci-fi epics until 2634, the year war is declared on the Kilrathi. 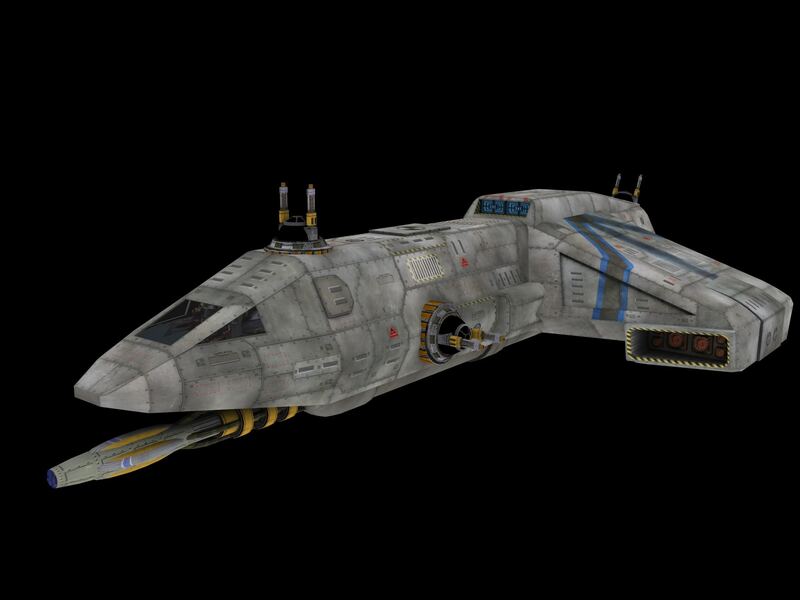 That's an interesting reference point for their timeline, as there are quite a few explosive years in Wing Commander lore. What year would you have chosen as most dangerous? As the New Year begins, let's look forward to what might happen, using video games as our crystal ball. Hint: lots of robots, explosions, and cutscenes. And here we are in 2634. Beyond this point, things get too vague to be relevant - in 623 years, do we really think the human race will resemble us at all? Not bloody likely. I'd bet it's going to be like Wall-E but a thousand times worse. We'll basically be Slurpees with bluetooth. 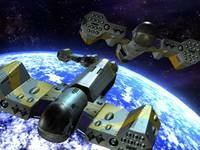 The Wing Commander series posits a much more romantic future - at least we're still walking on two legs. But space is still full of jerks, and in 2634 we declare war on the Kilrathi, a race of two-legged cat people who won't leave us alone. This kicks off a cavalcade of disaster that leaves hundreds of thousands dead. Here's another beautiful batch of micro-airbrushed miniature models by Astro Commander. Like the rest, these are full of intricate detail! 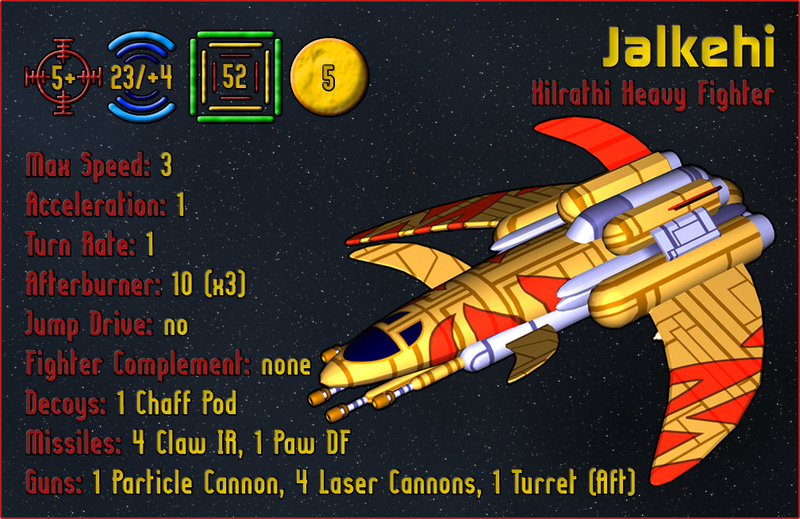 Just check out the jaws on the Vampire, Kilrathi writing on the Jalthi, spotlights on the Tallahassee and crackling plasma weapon the Midway. They all have a cool engine glow and squadron markings as well. Astro's not stopping here either. 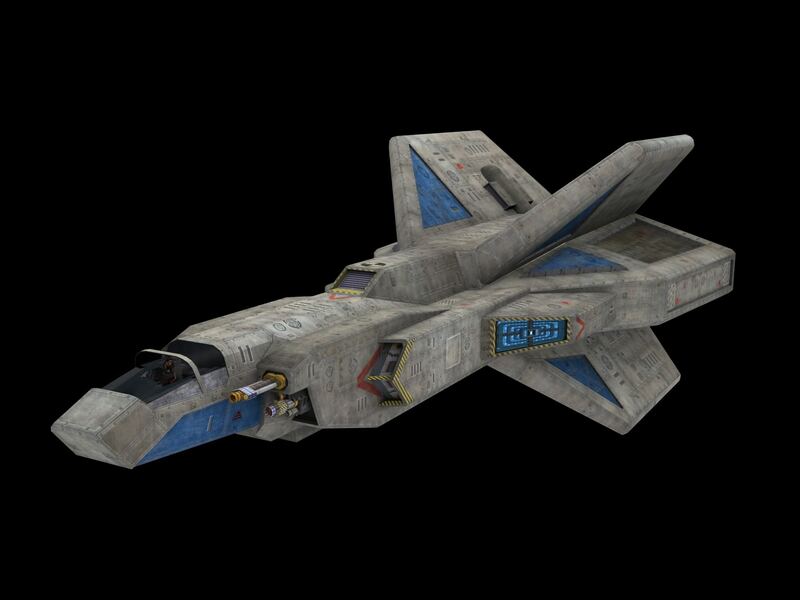 There are more painted Nephilim and Kilrathi designs on the way, and soon we'll get a glimpse of some Confed capships from earlier in the series. 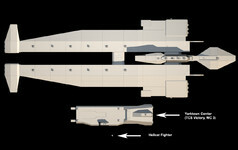 Fighters are fighter scale 30-40mm while the Midway is about 90mm long if I remember correctly. The modern incarnation of the CIC Forums turns eleven years old today! While the Y2K bug left most of the world unharmed, it did a number on our ancient 20th Century message boards, which had to be rebuilt from scratch. 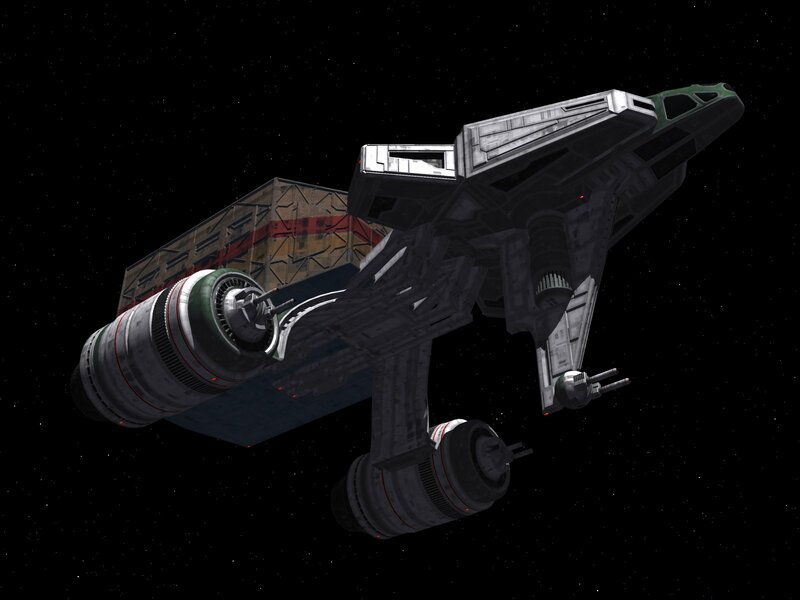 We lost thousands of great threads about Secret Ops, Prophecy Gold, False Colors and the Wing Commander Movie, but the good news is that our posters have bounced back with nearly 25,000 new threads and more than 360,000 posts since. Late 2000 - We switched from Ultimate BulletinBoard to vBulletin and gave the forums their own domain at Crius.net as a tribute to Privateer 2. 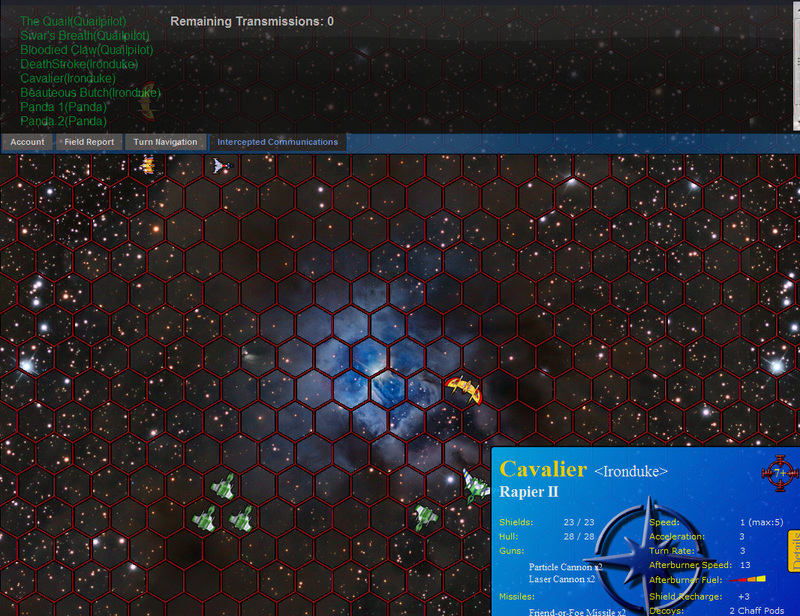 This also allowed us to deal with hosting limitations of the day and spawned SolSector.net. 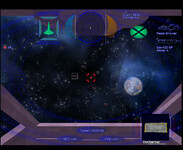 August 11, 2001 - Customizable color layouts first became available. July 4, 2002 - The Off Topic Forum first opened, which was a controversial decision at the time! The idea that communities would form around a particular thing and then might want to discuss other subjects was a relatively new concept. In the message board equivalents on the Internet of the 1990s, posting off topic material was frowned upon. February 2003 - We held a logo contest, and Filler's winning entry still graces the top of the boards. July 2004 - The new [Discuss] link provided people a jumping off point to talk about front page news posts in the new News Discussion Forum. August 11, 2005 - Years before your friends filled your Facebook inbox with annoying Farmville and Mafia Wars invites, the CIC Forums Arcade added mini games and scoreboards (which were quietly deactivated a couple years later). February/March 2007 - The Forums were upgraded to accept XBox Live Gamertag inputs, and the board for the upcoming Wing Commander Arena displayed XBox Live info right next to your name. 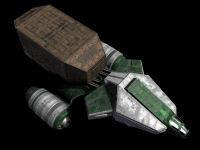 June 9, 2007 - A Squadron feature was activated to allow people to form groups around their Crius.net identity. This feature was set up for Arena, and was also intended for Prophecy multiplayer matchups. January 4, 2009 - A Feedback Forum was set up to allow people to more easily provide site feedback and comments. August 29, 2010 - Our first mobile plugin made it easier to post from cell phones. There'll certainly be more to come on this in the future. And you can still find references to the Wing Commander Chat Zone throughout Crius.net, which was a name borrowed from Origin's original web board in the 1990s. Head on over now and ask, comment and reply away! 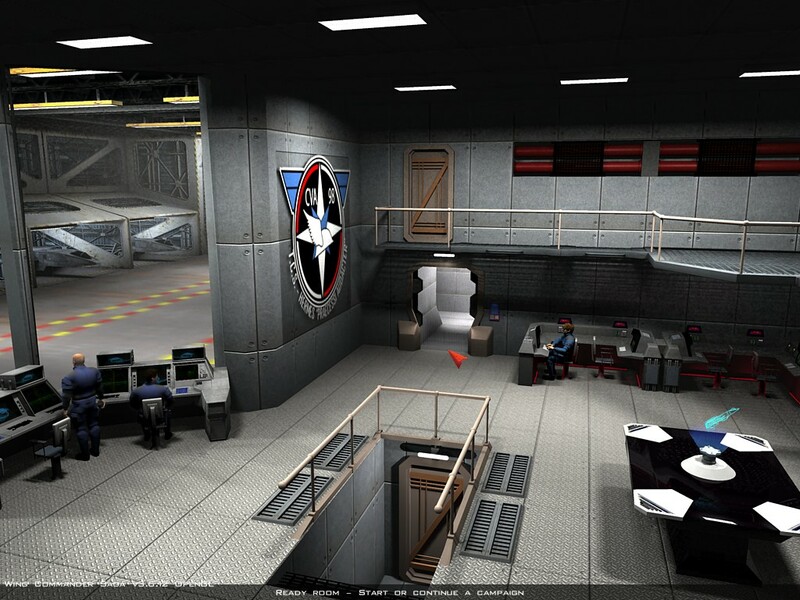 WC Saga has posted screenshots of its "main hall" ready room that serves as the central launching point to the game's various areas. 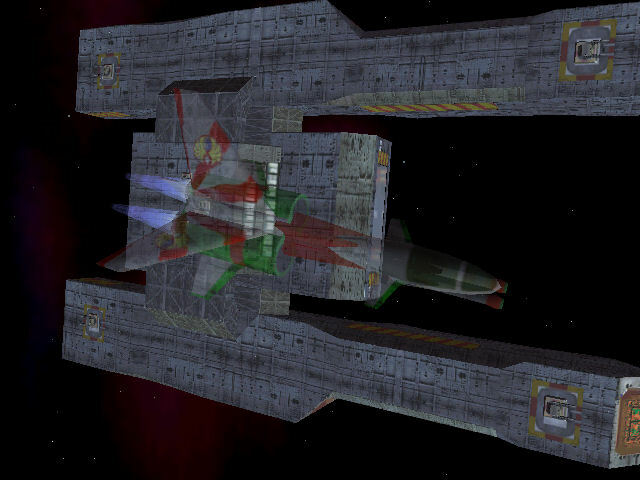 Doors and console lead to different menu options, and fighters occasionally fly by the flight control window. 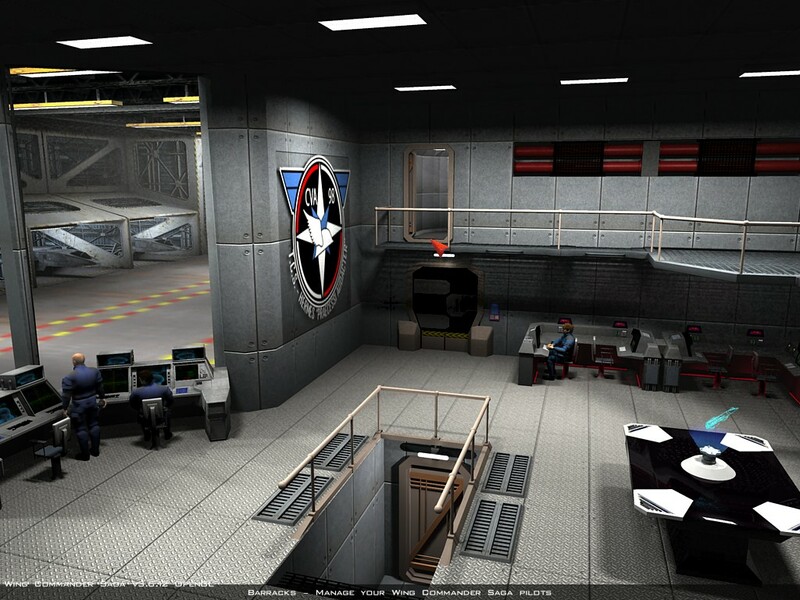 You can find more screenshots here. 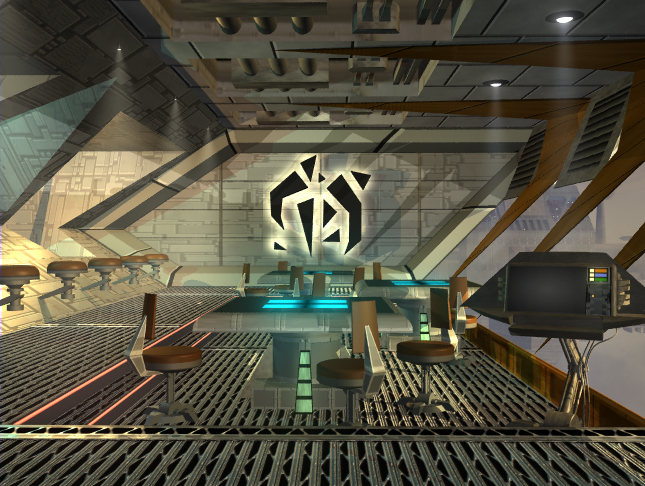 We have tried to make the main hall a compelling hub for the game that provides ambiance and atmosphere. 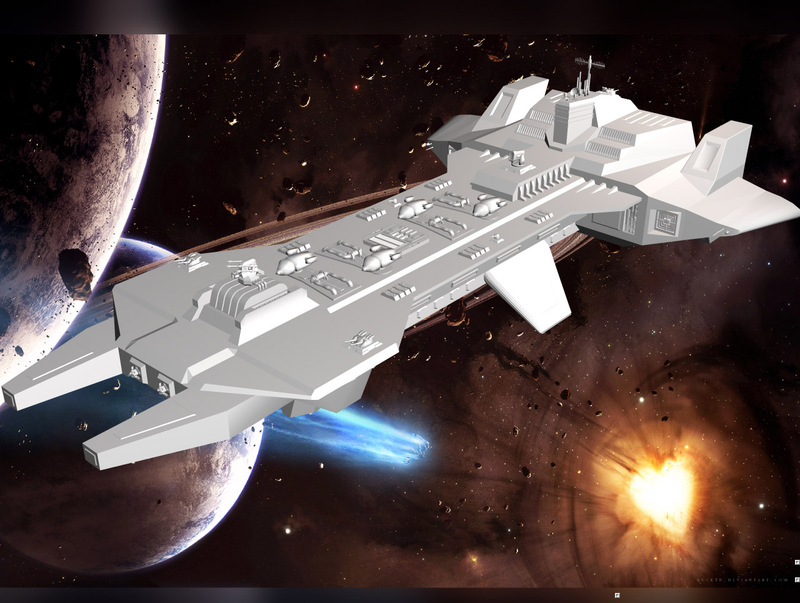 We have tried to pay close attention to detail so that when you “step into” the main hall, you will feel the buzz and cadence of life aboard a space-borne carrier. 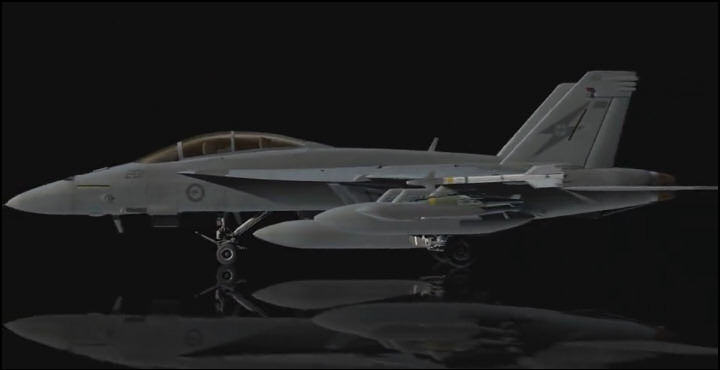 The Australian Air Force and Boeing Store have posted a fun 'put together quickly' video detailing the construction of the AF/A-18F Super Hornet. 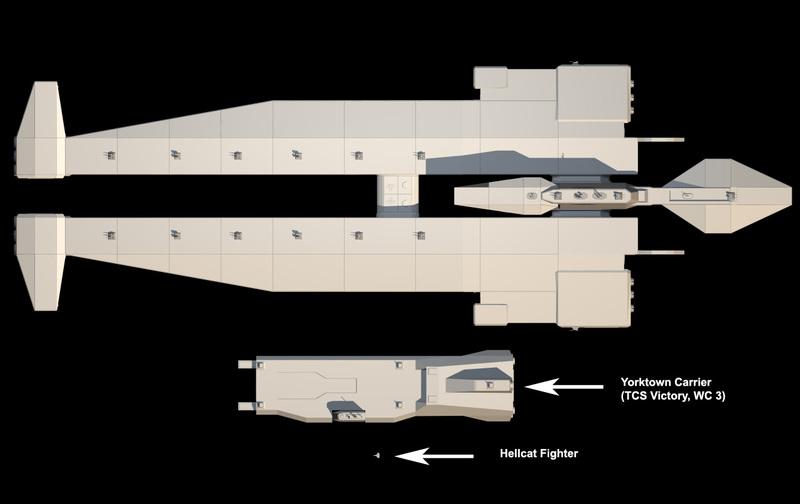 27th Century fighter construction is certainly a bit more automated than current day manufacturing, but it's pretty interesting to see what all goes into building one of these things today. The video posted on Facebook is a bit higher quality than the YouTube equivalent. What better way to start the new year than by watching Boeing build an F/A-18 Super Hornet? 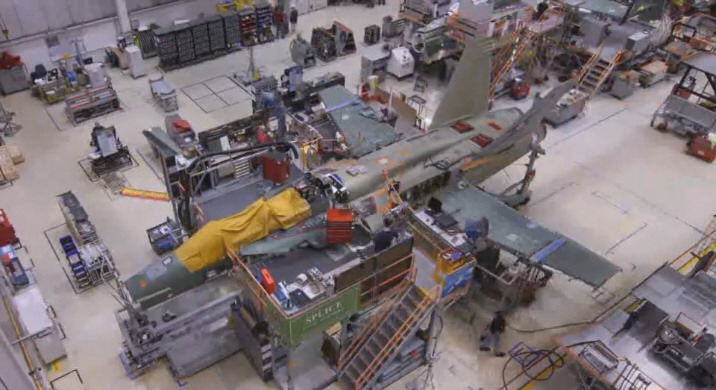 How about watching it all come together in under four minutes on time-lapse video? Happy New Year to Wingnuts everywhere! 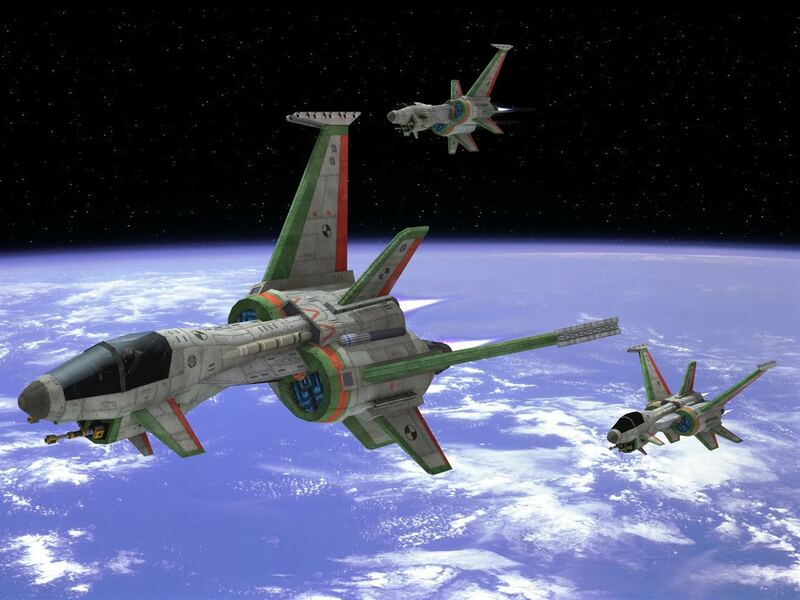 Wing Commander fans have amazed us again with another full year of dedication to the series and community. A year ago, I never would have dreamed we'd have found the Movie Cutaway Poster or be allowed to share Wing Commander 1 with you all. There's more exciting stuff like that on the way, and 2011 will undoubtedly bring tons of surprises as well. Thank you for continuing to follow our Wing Commander adventures! Our annual new years poll is up now, and here are the results of last month's poll. 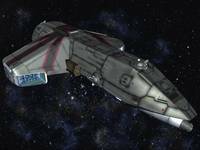 The classic 'numbered' Wing Commander games and the original Privateer about evenly split the vote. It's very hard to choose just one! Here are the nominees for the 10th annual CIC awards! Wingnuts can now vote for one pick in each category: Fan Project and Web Site of the Year. 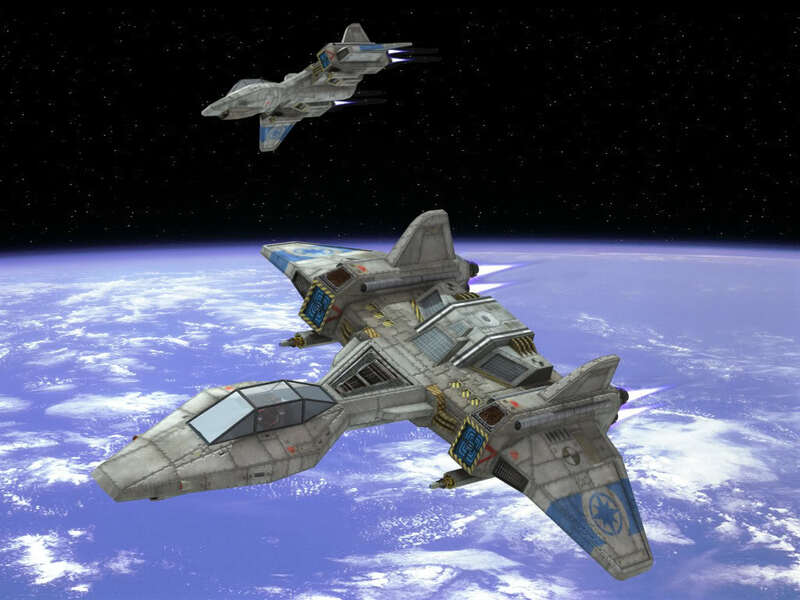 Things to consider include how big of an impact each undertaking had on the community and their sustained commitment to being Wing Commander fans. Of course, there were many daily contributions by many different people over the last year, so feel free to hit the comment button if you'd like to acknowledge anything that didn't make the cut. And without further delay, visit the voting booth here to cast your ballot! There you have them! Head on over and vote for one from each category now!